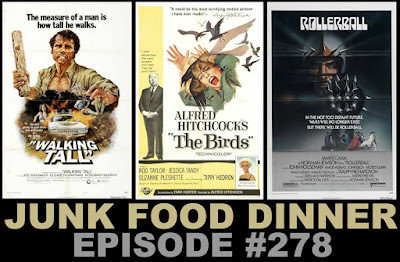 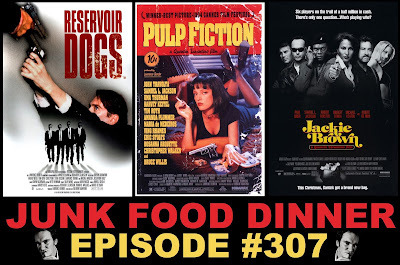 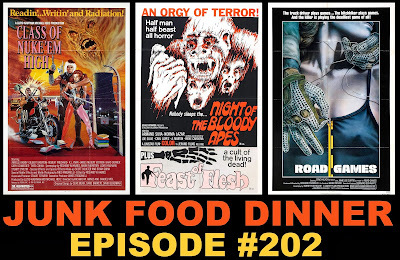 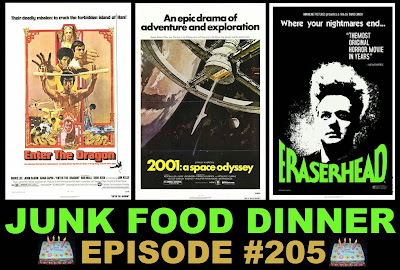 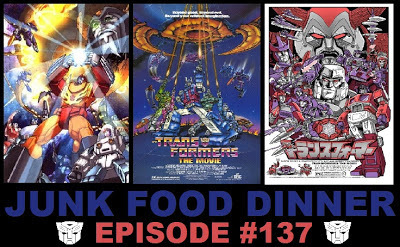 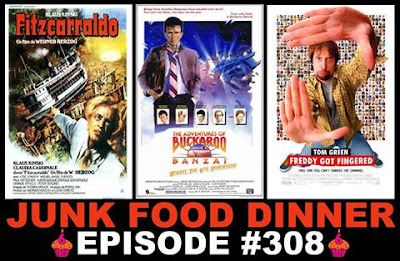 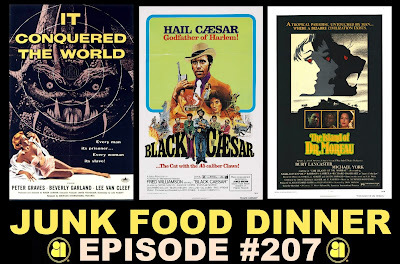 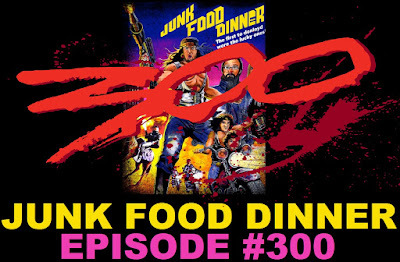 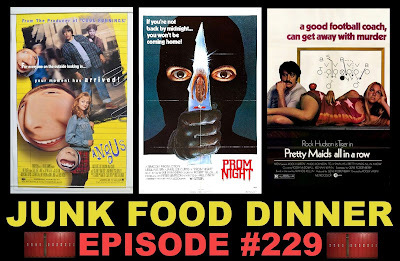 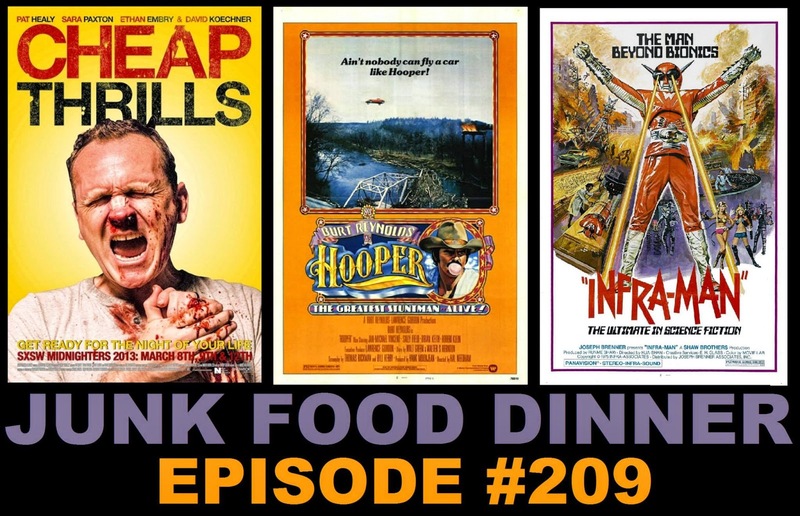 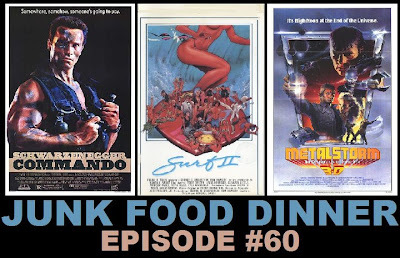 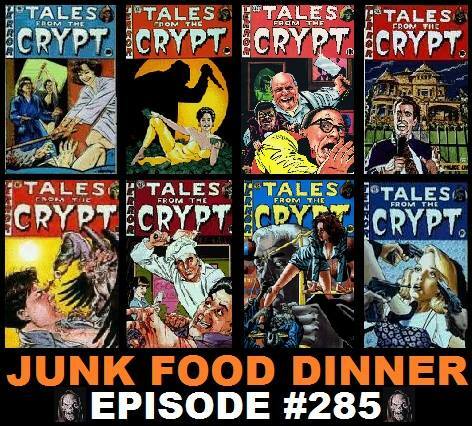 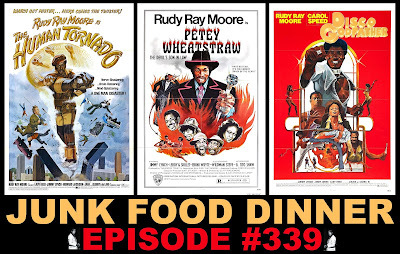 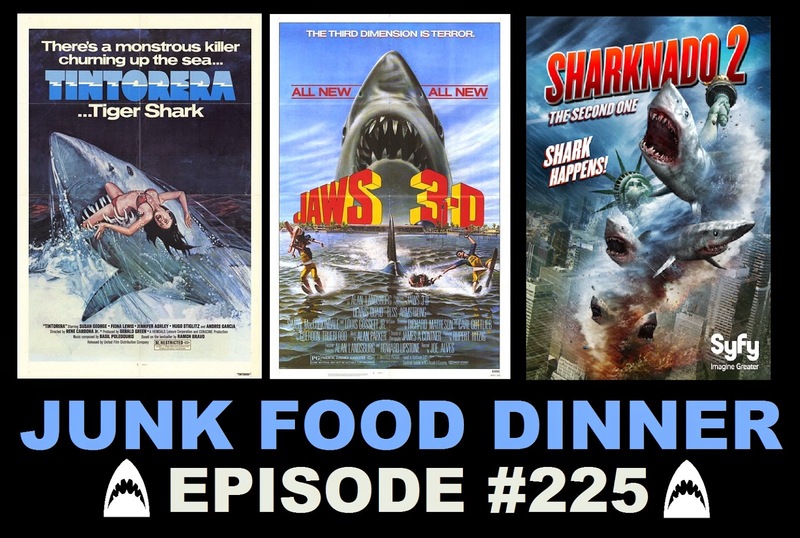 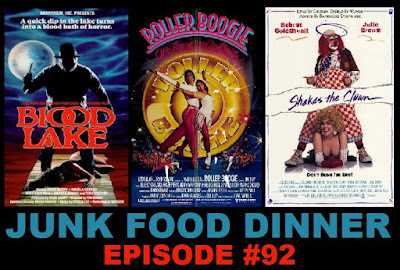 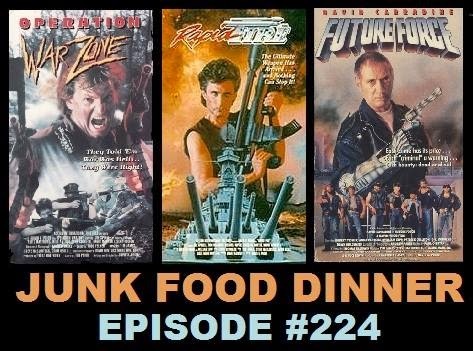 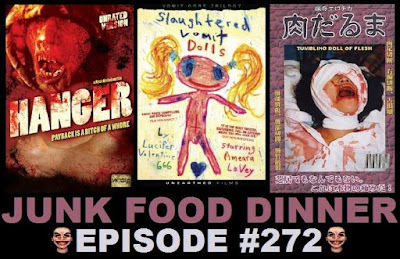 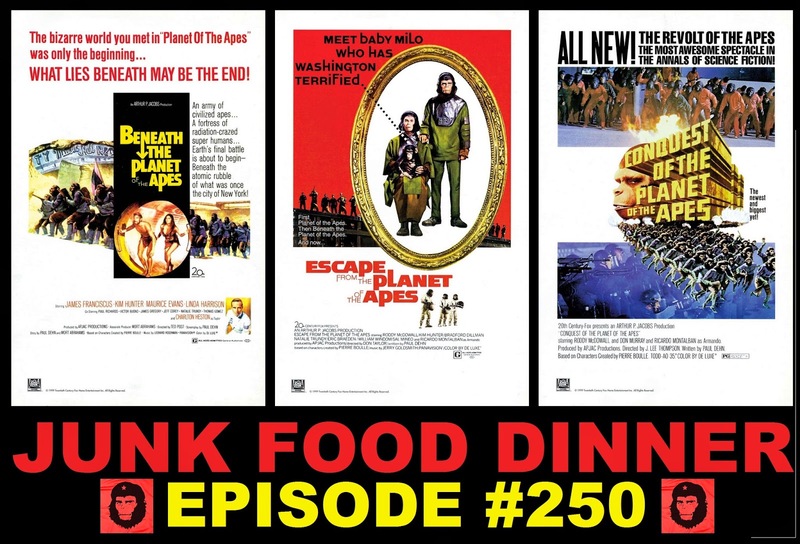 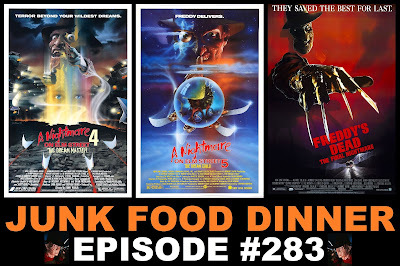 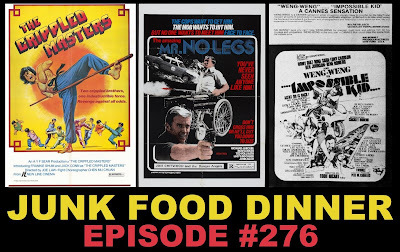 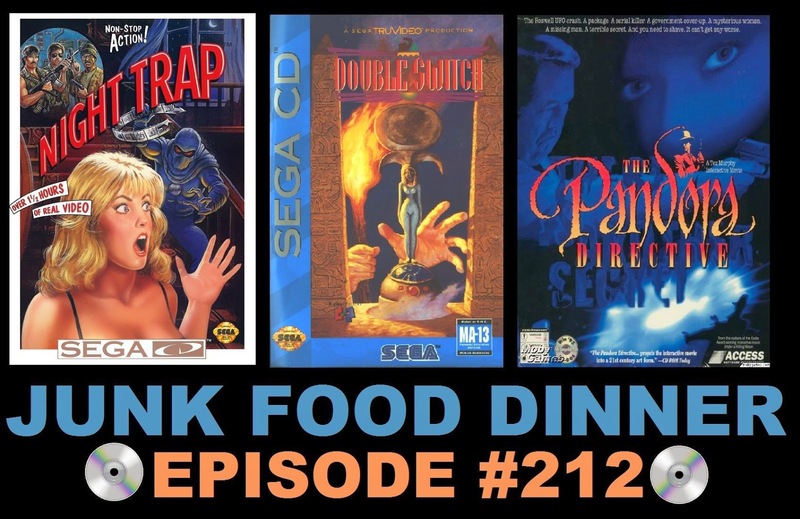 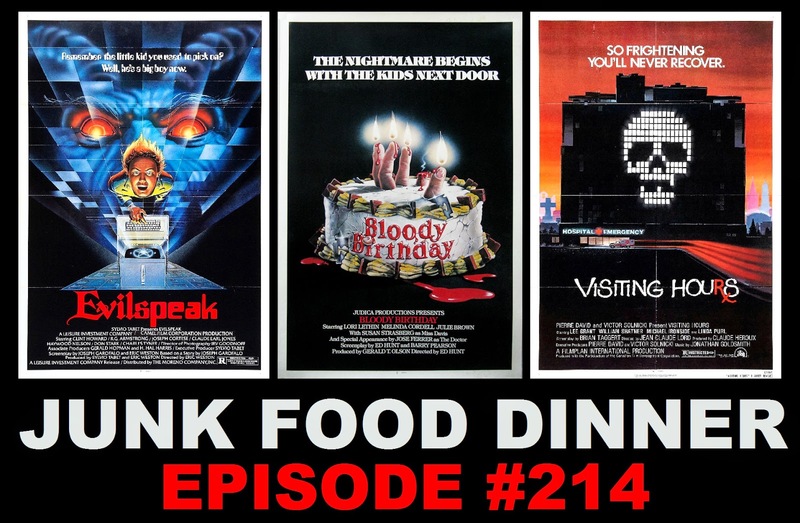 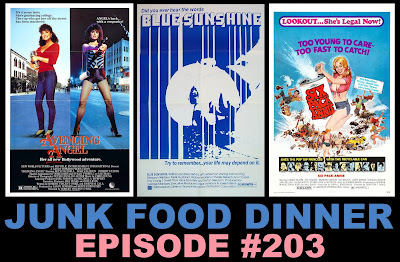 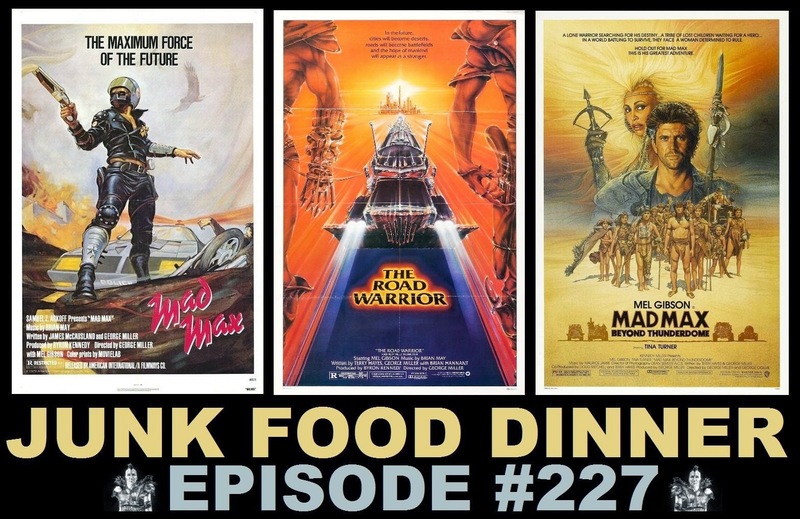 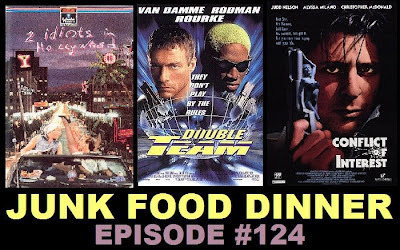 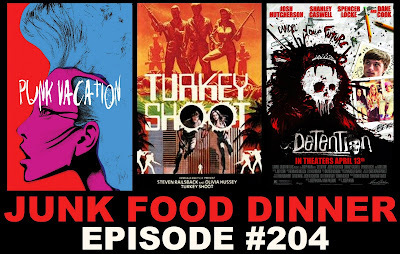 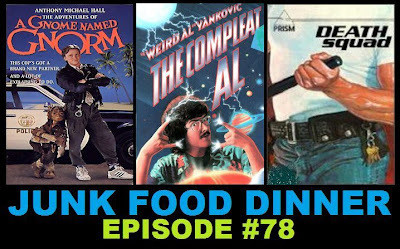 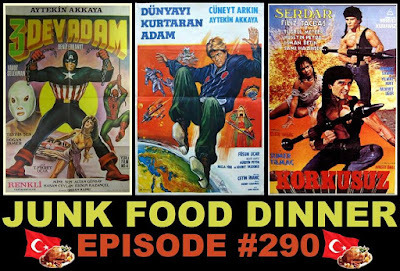 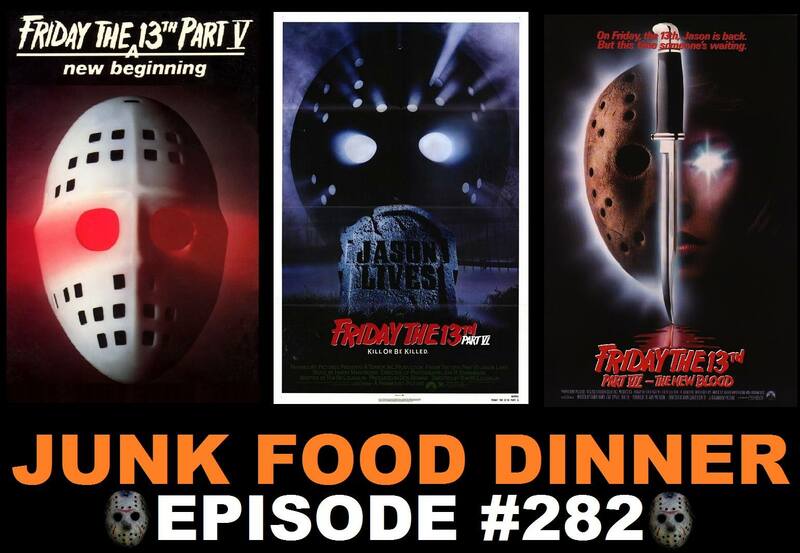 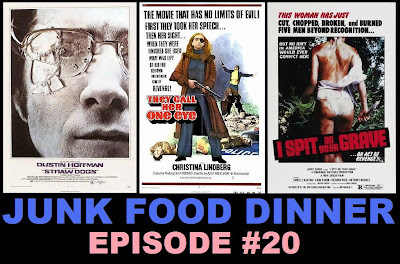 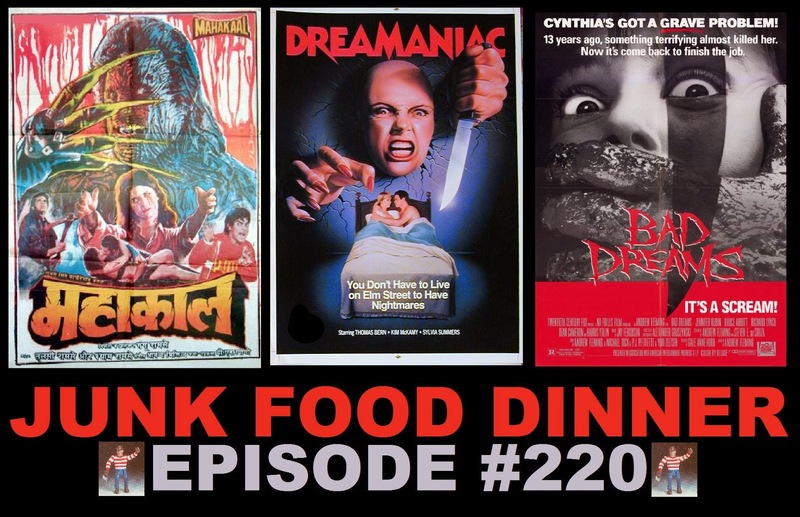 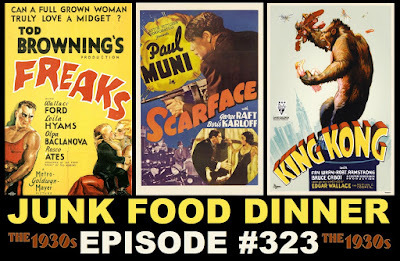 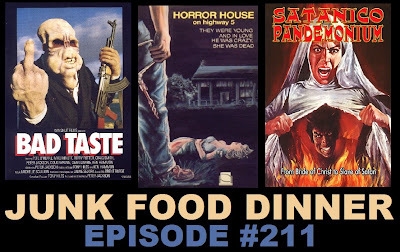 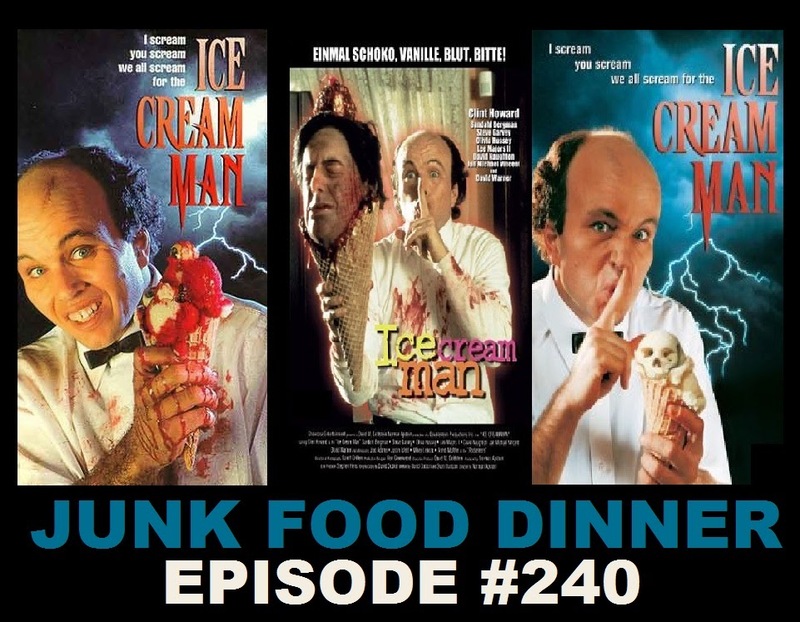 It's episode number two hundred here in the Junk Food Dinner offices, so we're poppin' champagne like we won a championship game! 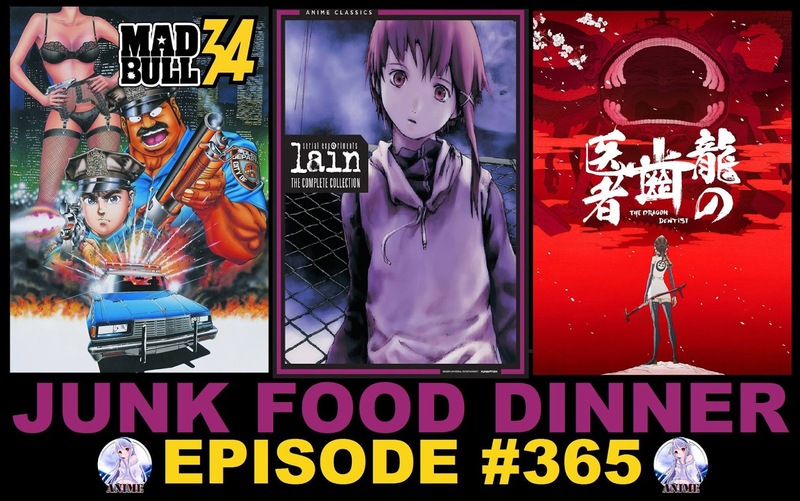 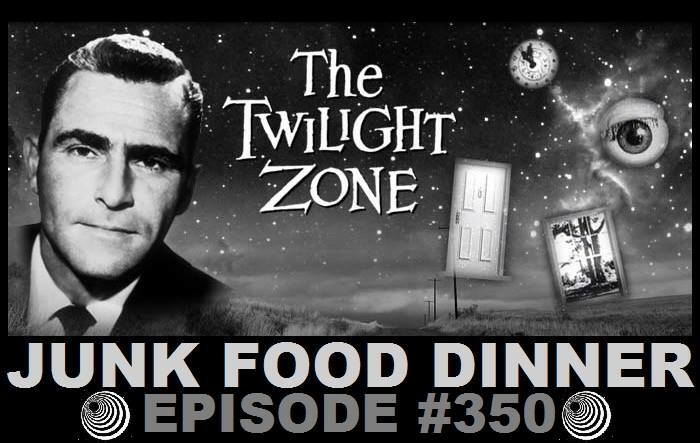 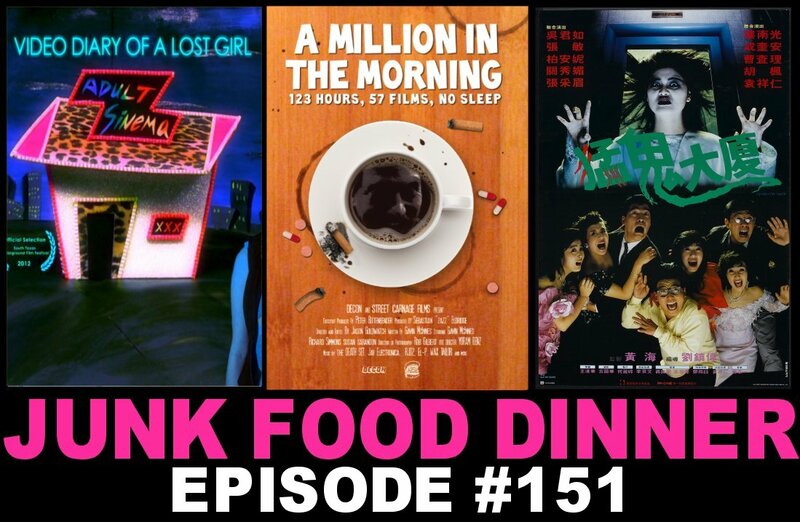 We reminisce about the past and are astounded we've this many episodes. 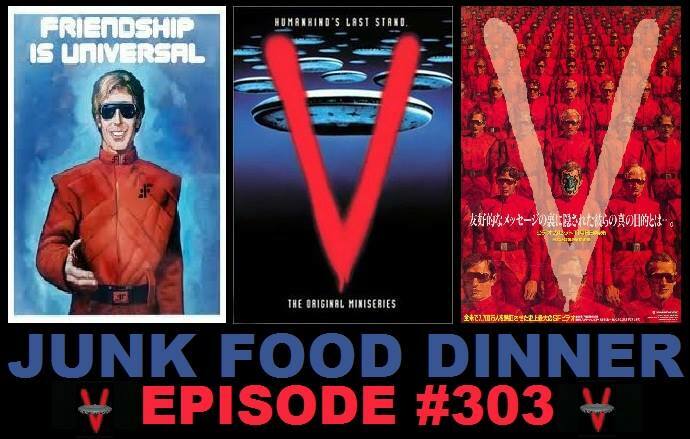 And then it's on to a mega Sci-Fi-Ebruary theme show! 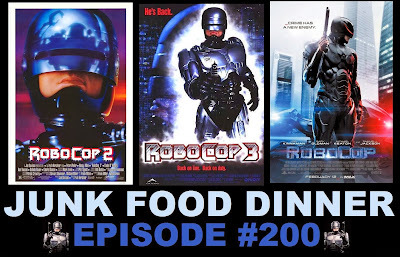 First, Robocop returns to fight greedy businessmen and drug gangs full of kids in 1990's "Robocop 2." 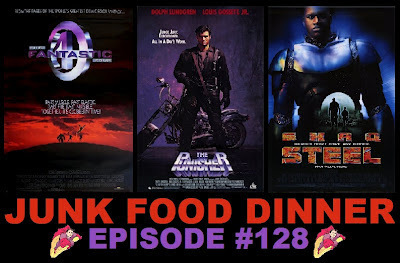 The original writers and director have left the series, but director Irvin Kershner ("The Empire Strikes Back") and writer Frank Miller ("Sin City," "The Dark Knight Returns") pick up the slack. 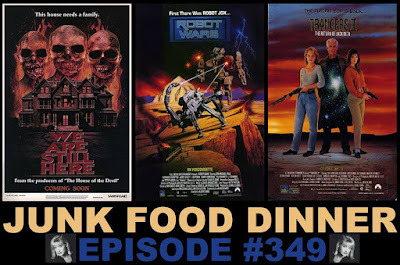 Next, in "Robocop 3," Murphy protects a group of squatters in a decidedly more "family-friendly" film, featuring robot ninjas, splatter punks and baby hackers. 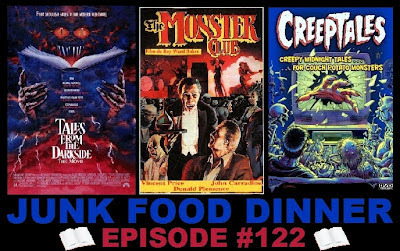 Frank Miller returns as the writer and Fred Dekker ("The Monster Squad," "Night of the Creeps") is now directing. Finally, we get into this year's "Robocop" remake starring Michael Keaton, Gary Oldman and Joel Kinnamen. 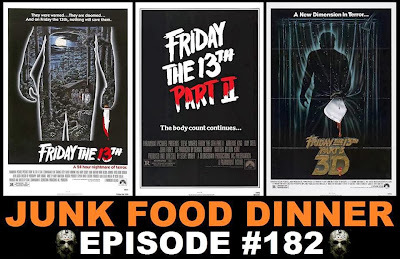 Does the remake stack up to the original? 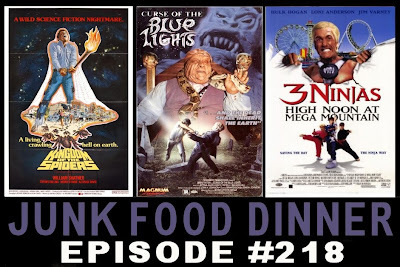 ... or the sequels? 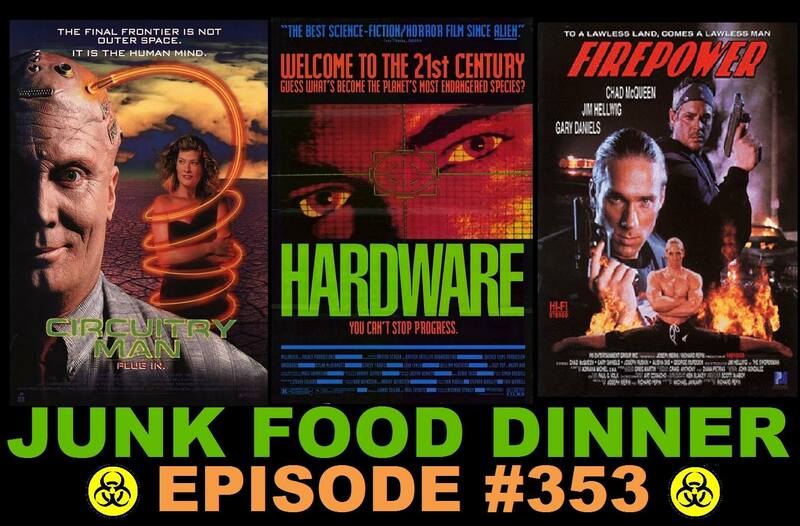 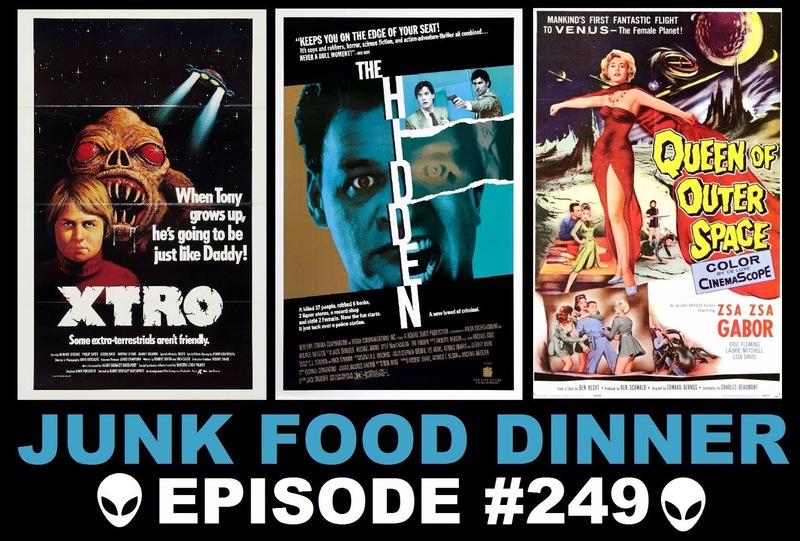 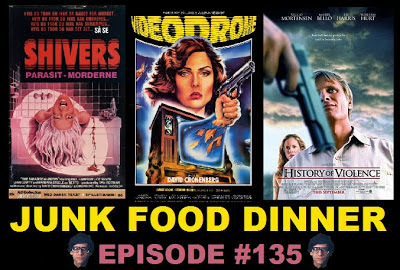 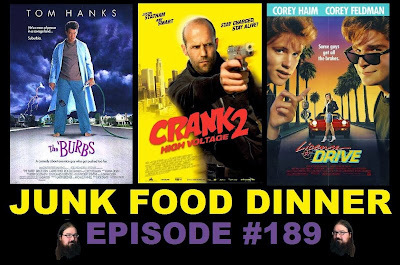 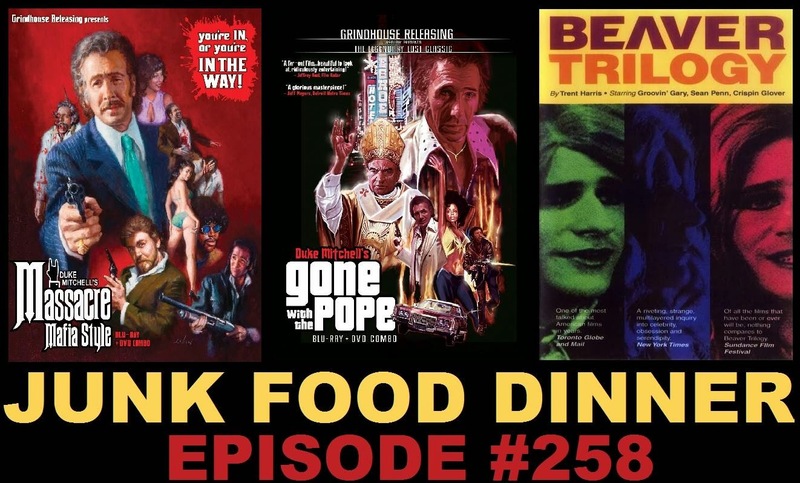 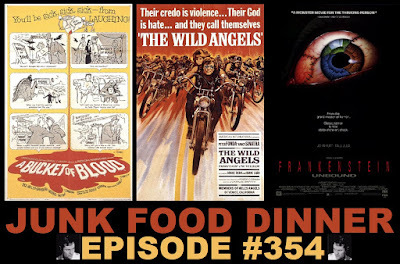 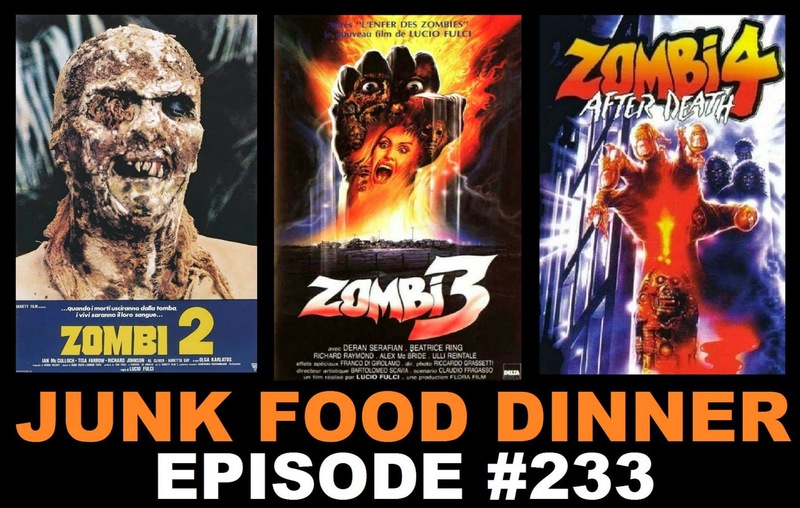 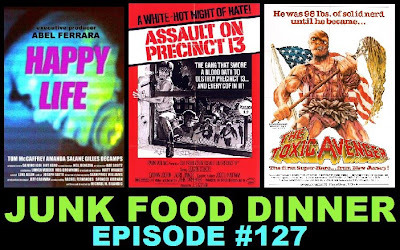 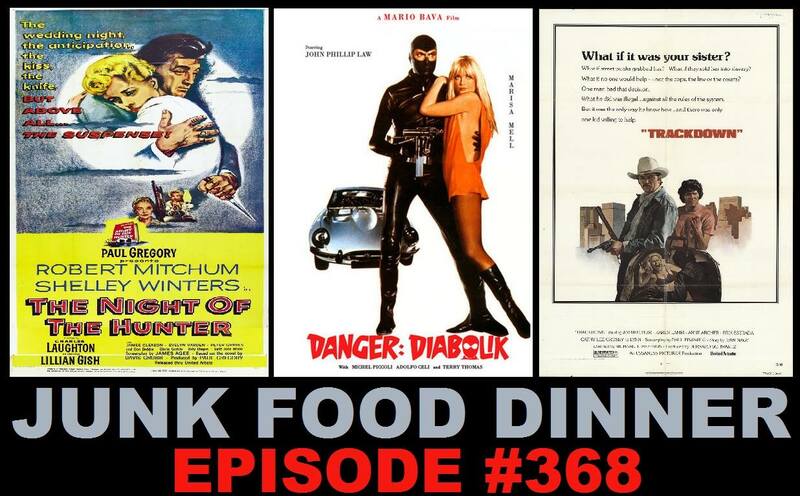 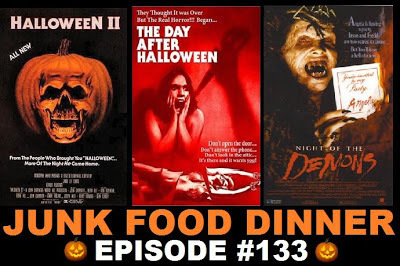 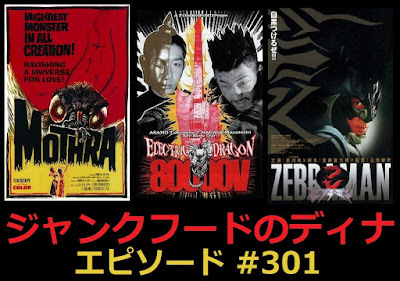 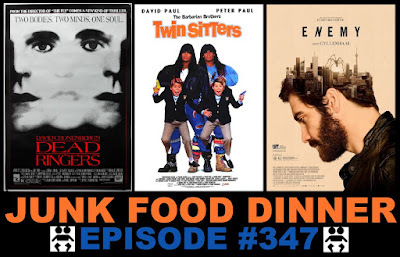 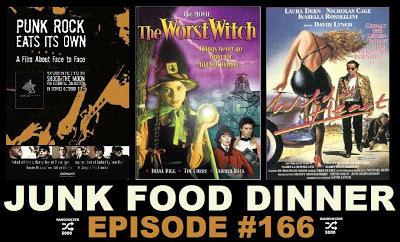 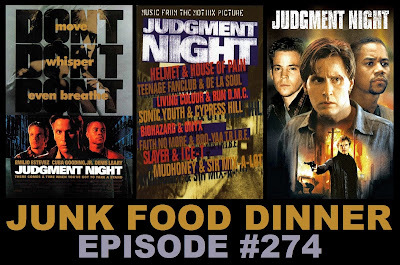 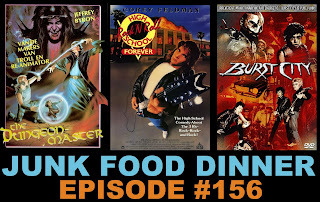 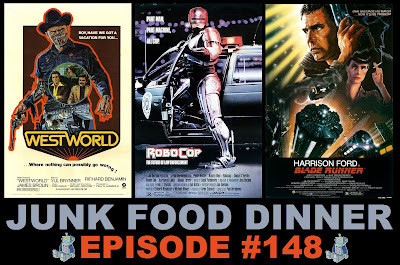 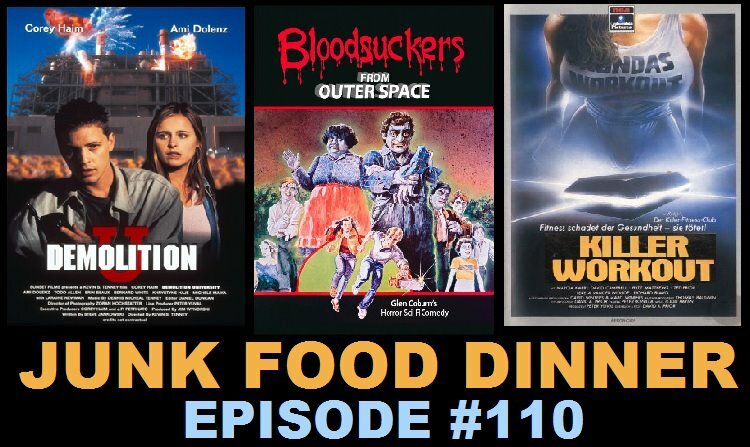 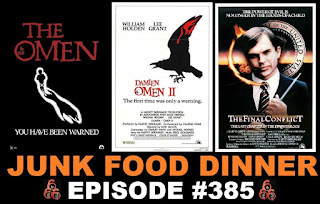 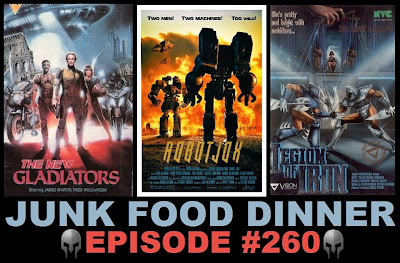 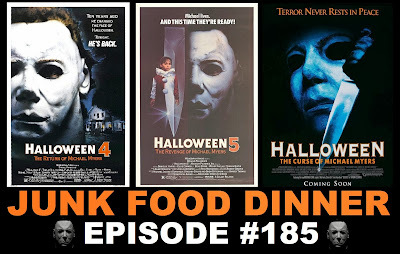 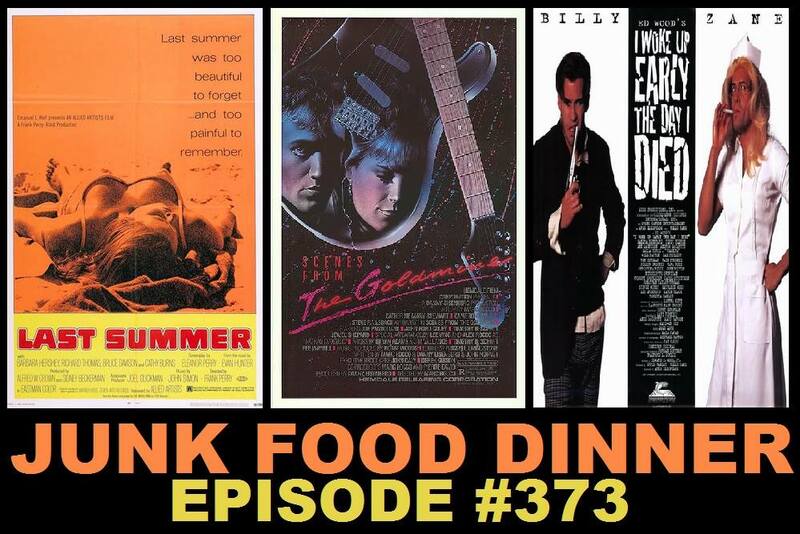 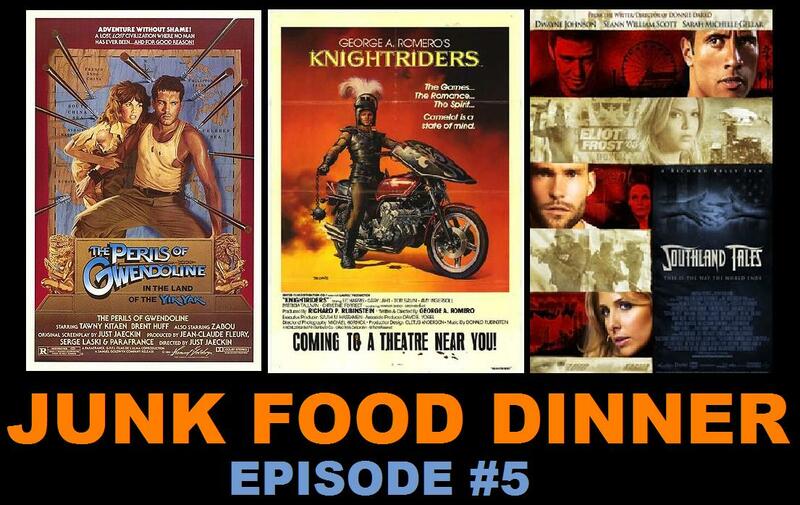 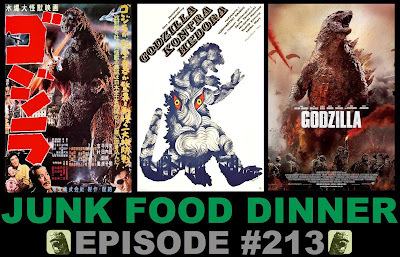 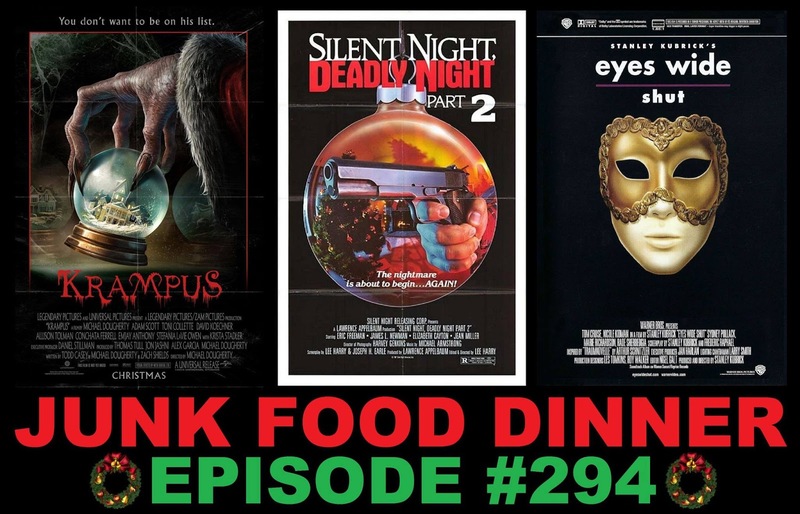 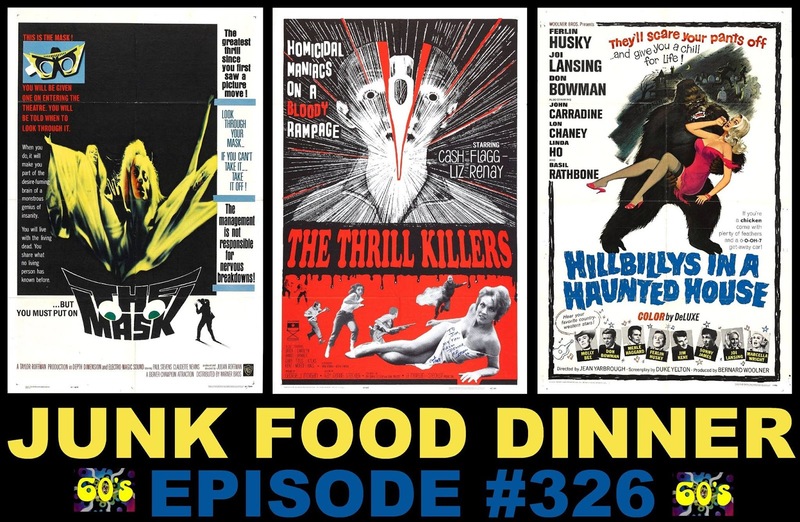 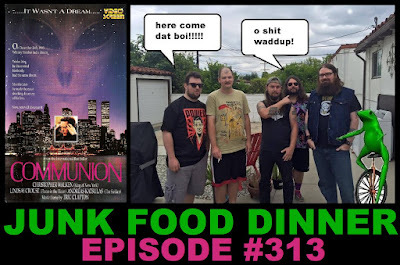 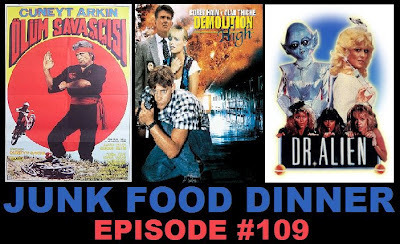 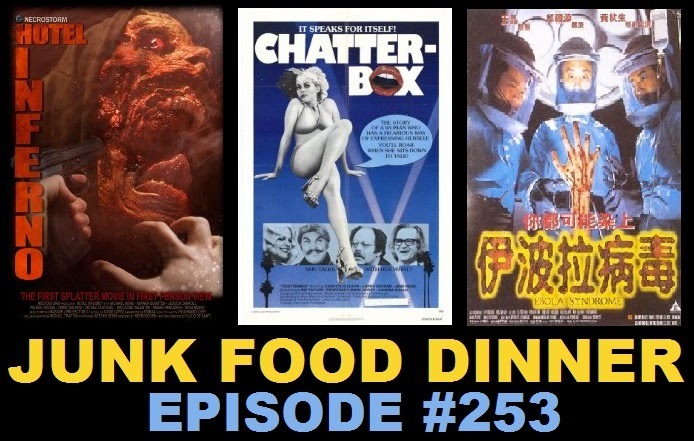 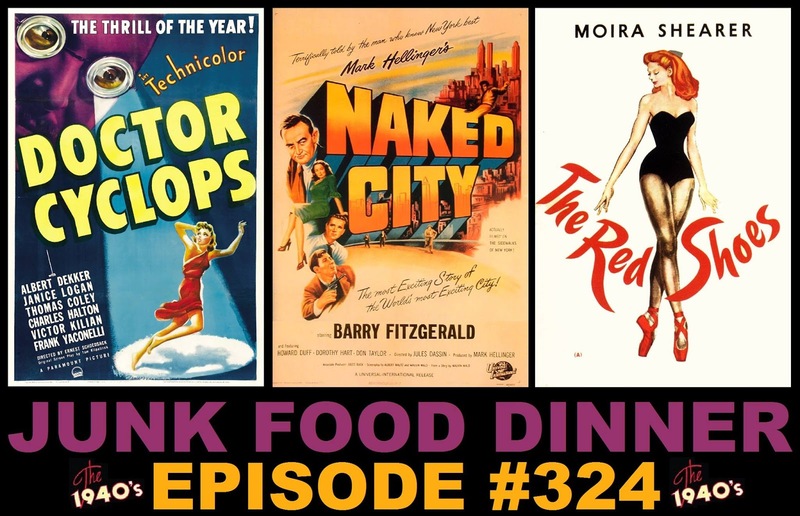 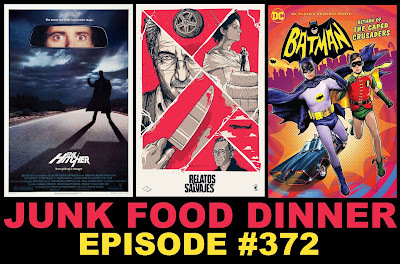 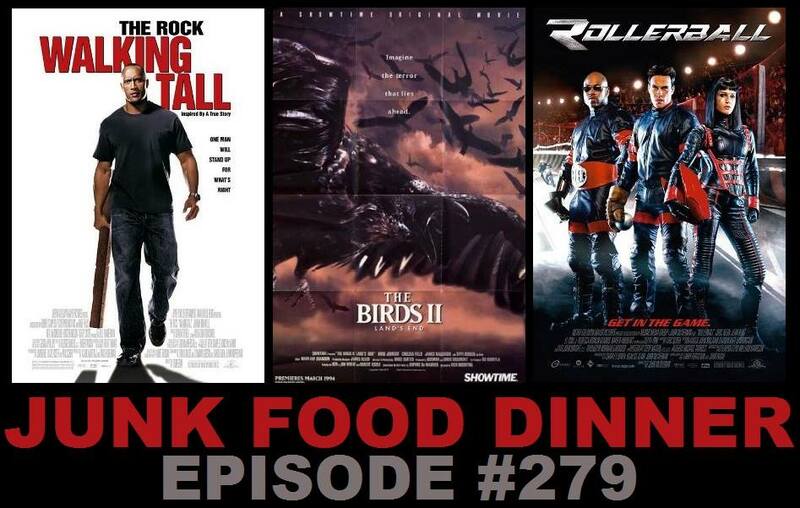 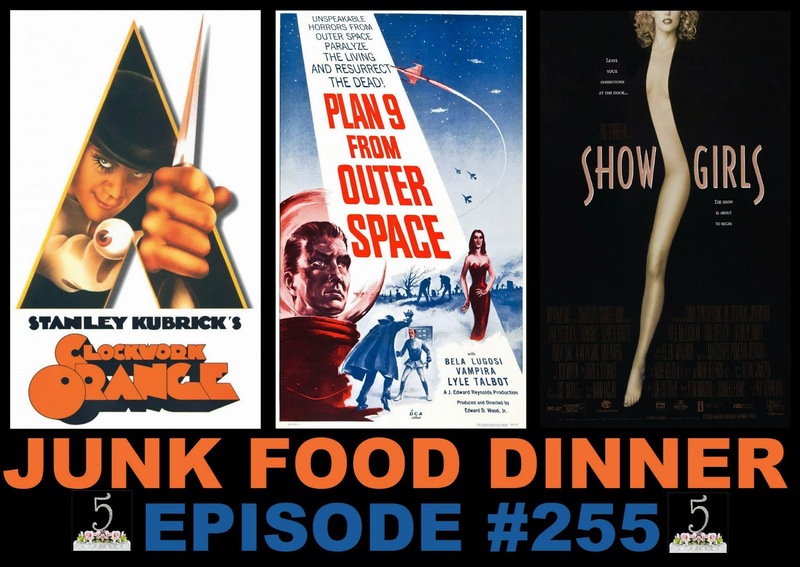 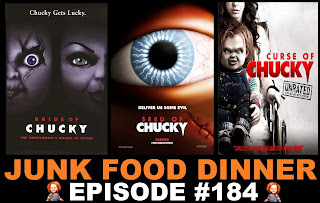 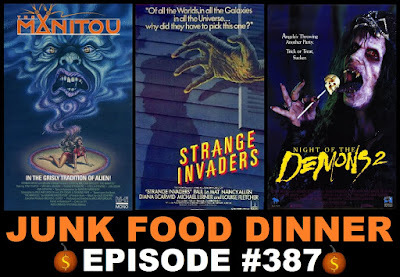 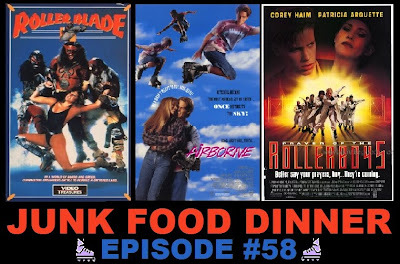 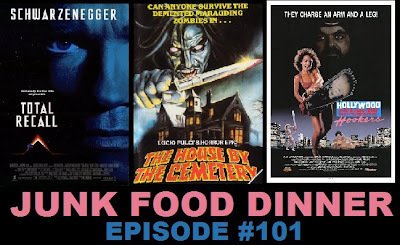 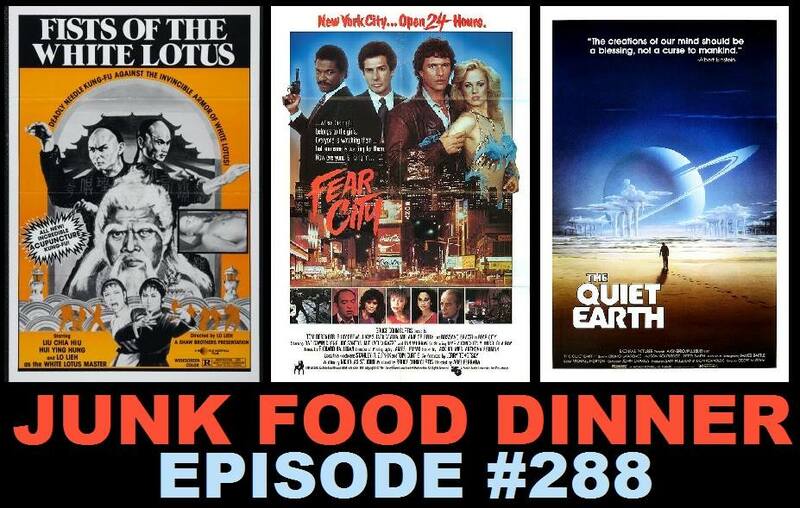 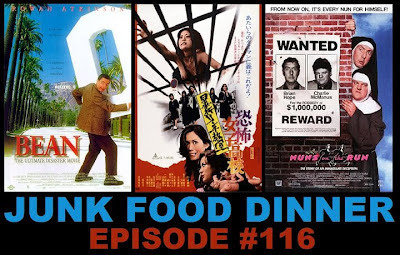 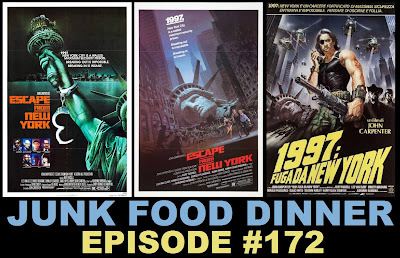 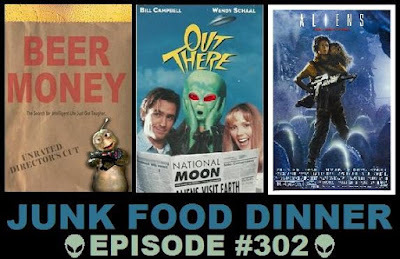 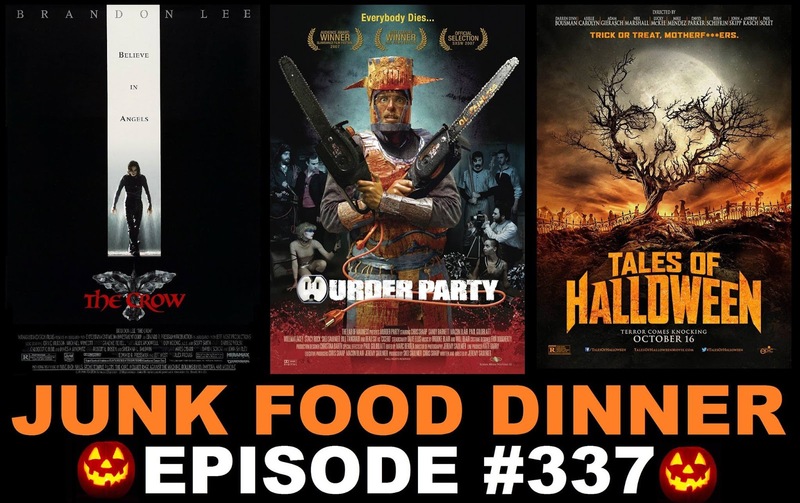 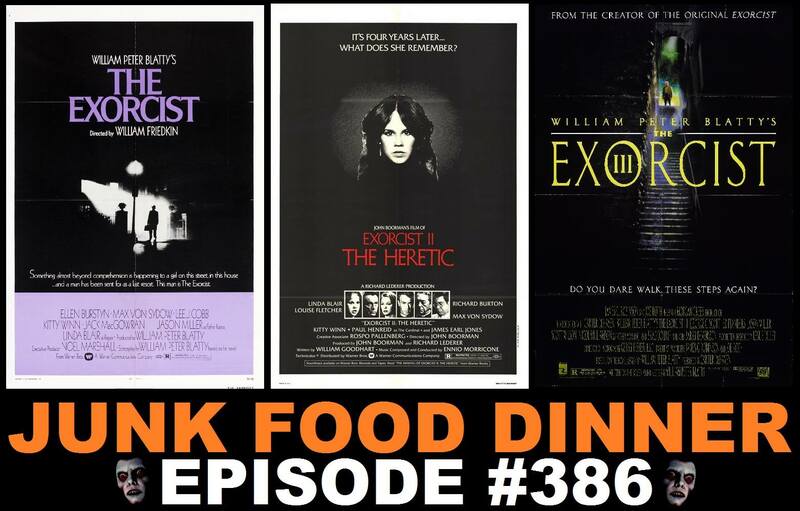 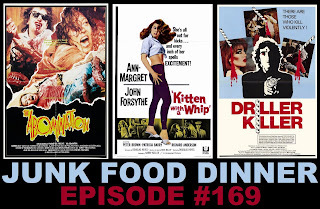 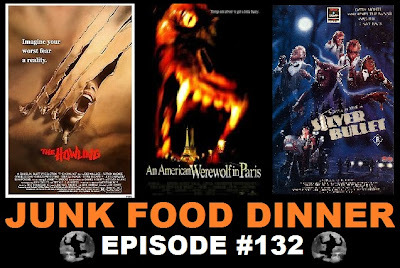 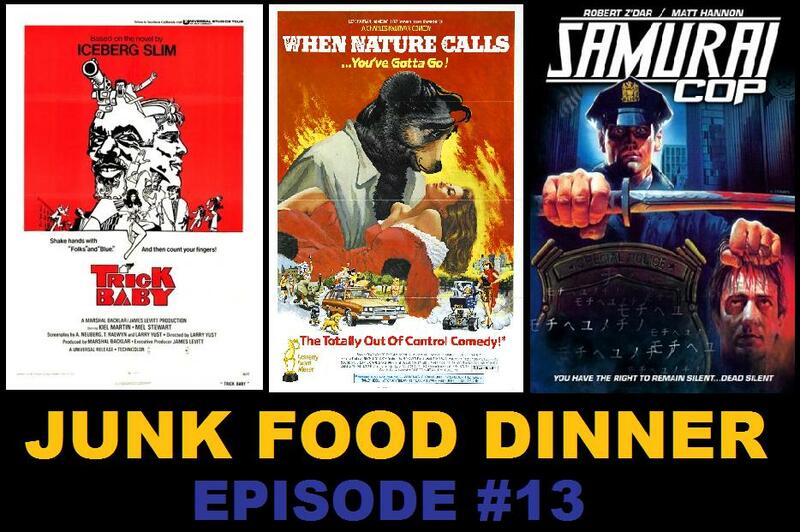 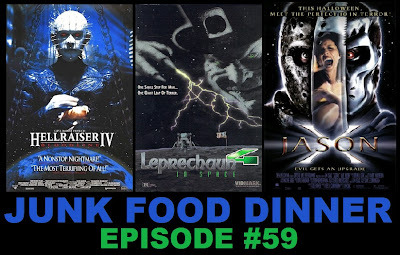 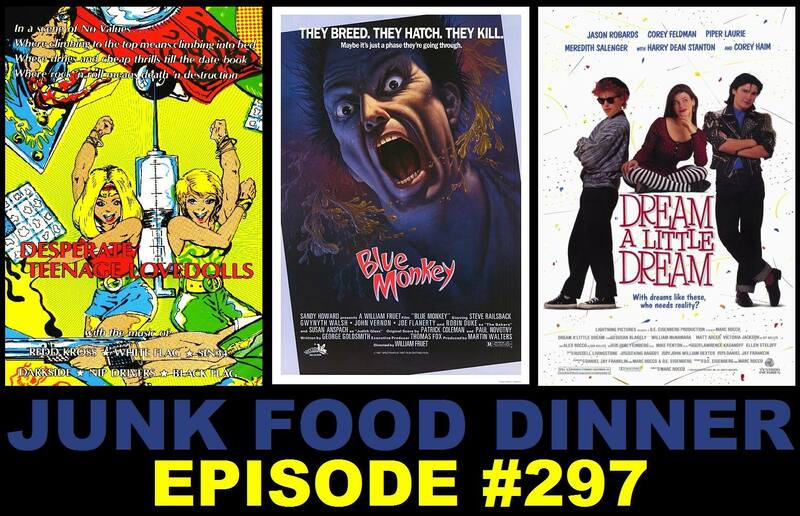 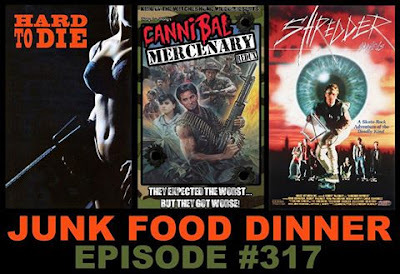 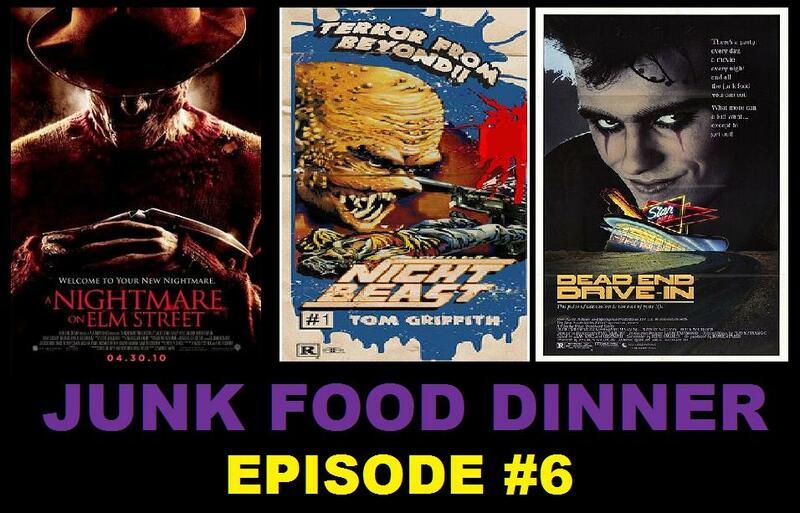 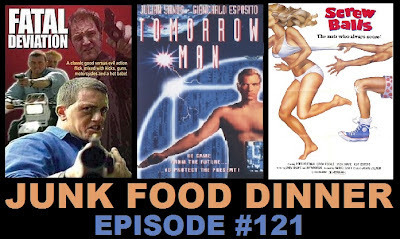 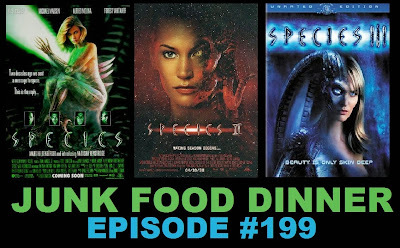 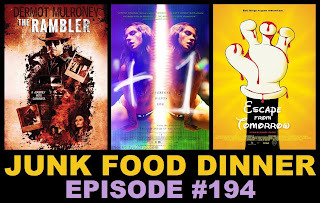 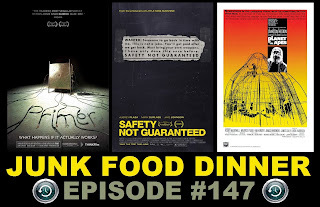 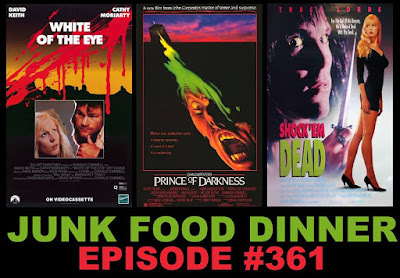 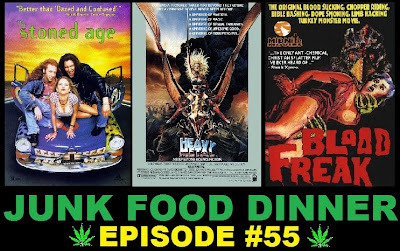 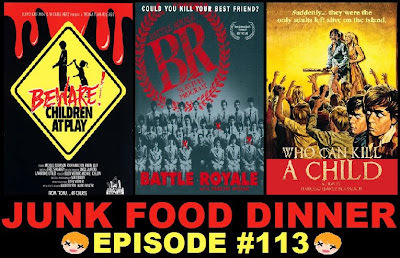 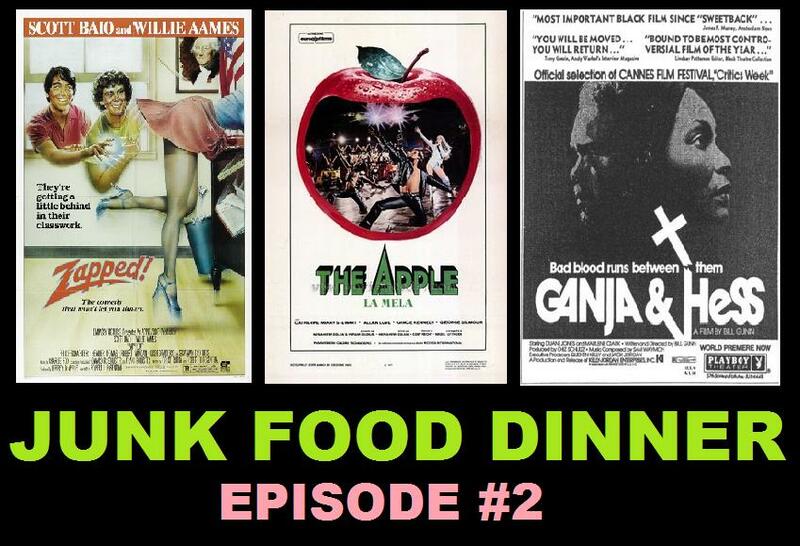 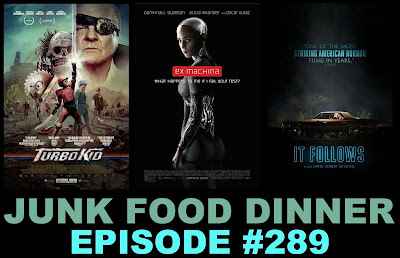 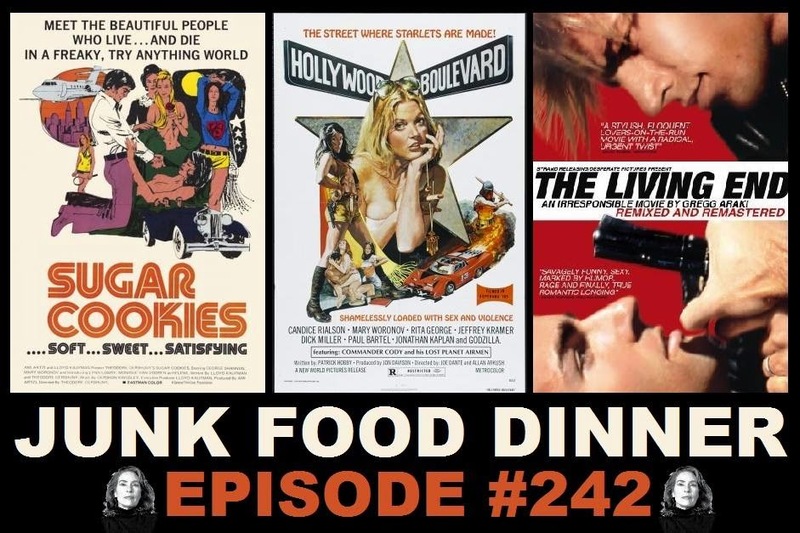 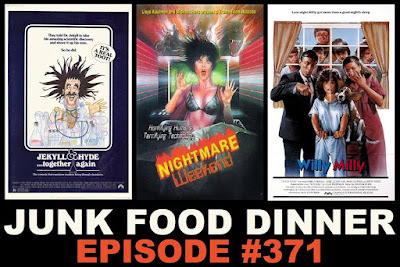 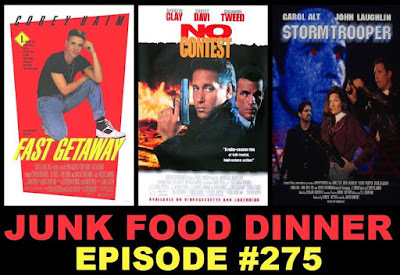 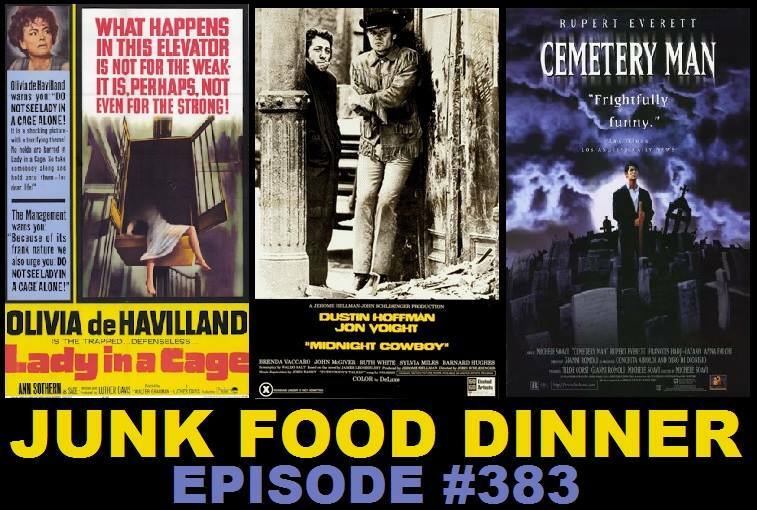 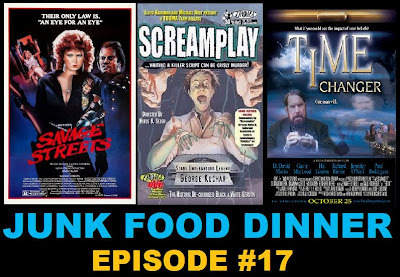 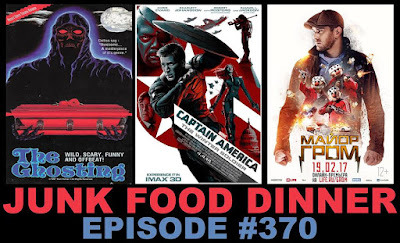 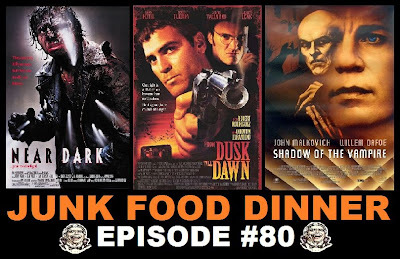 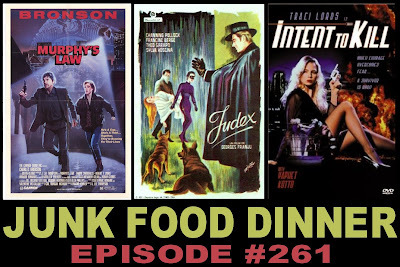 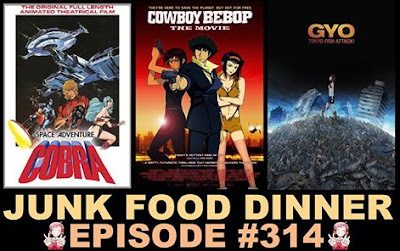 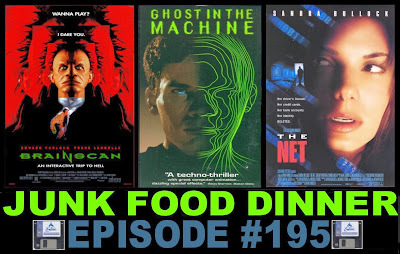 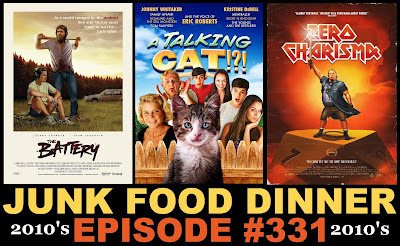 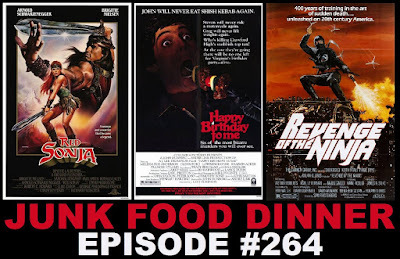 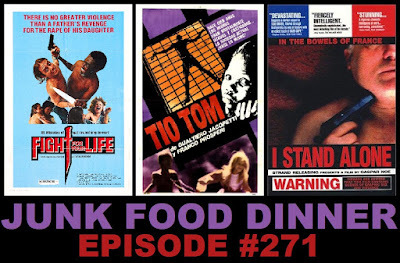 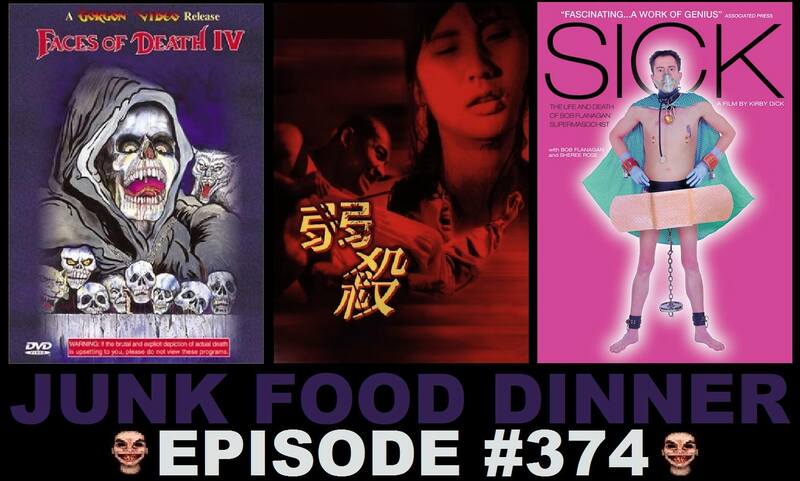 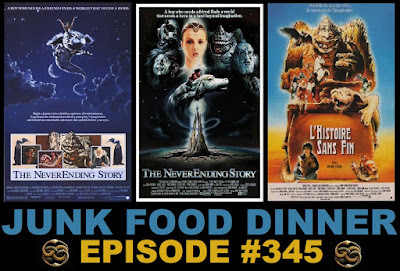 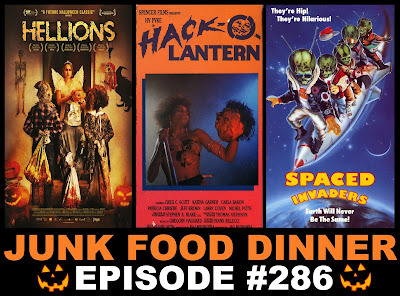 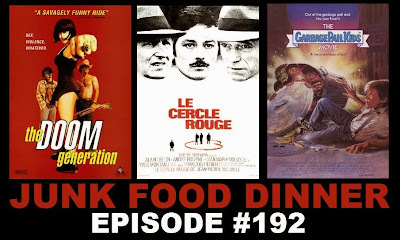 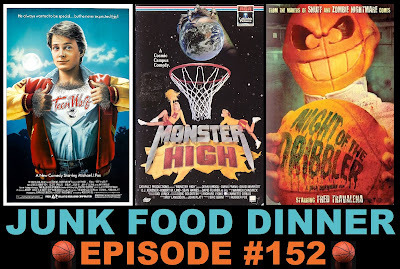 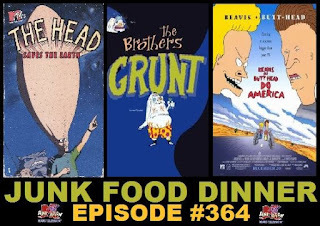 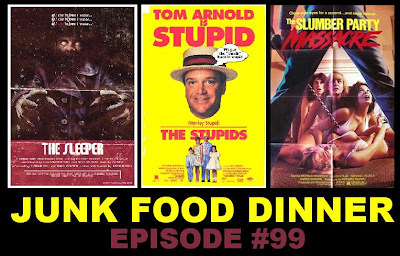 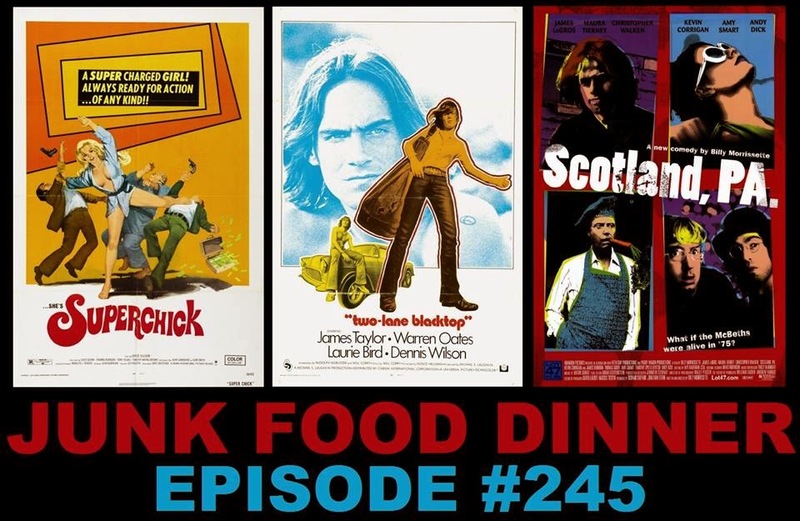 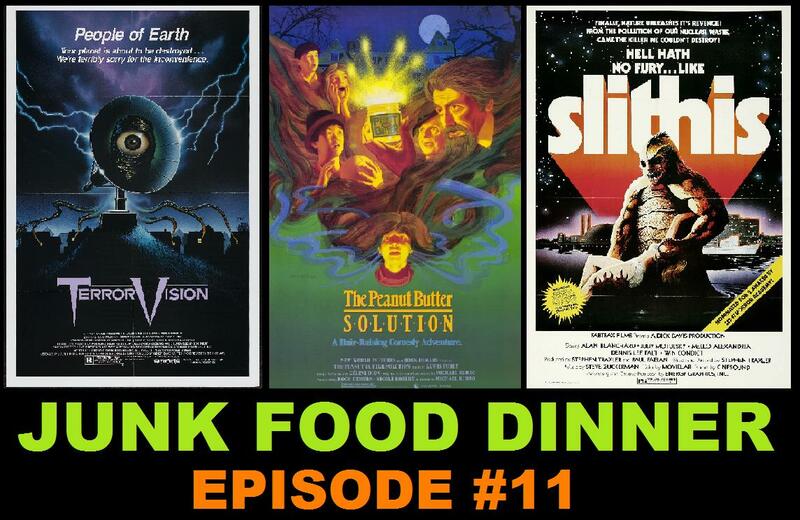 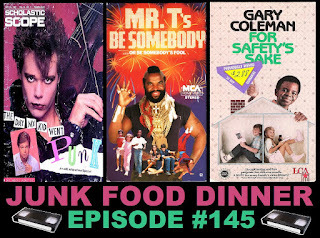 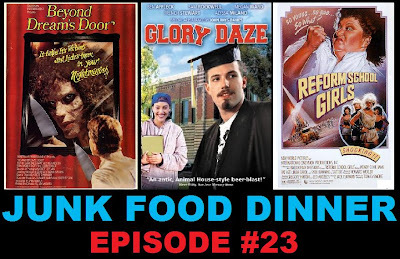 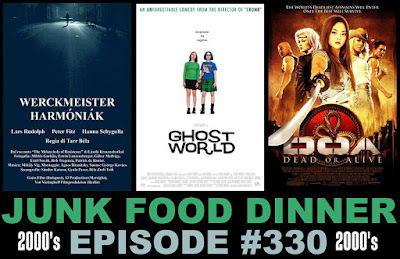 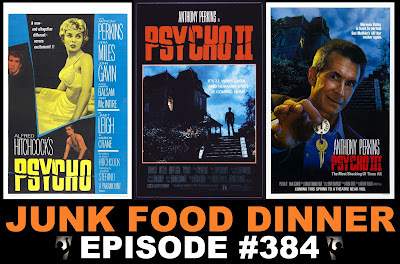 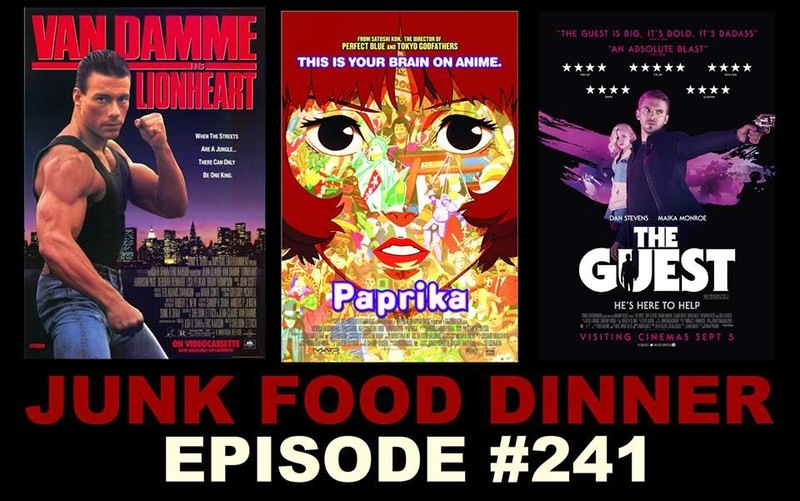 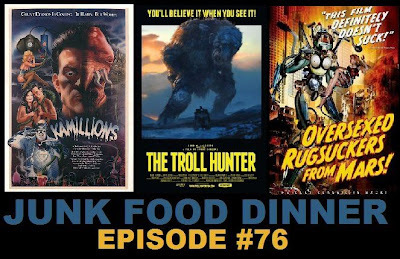 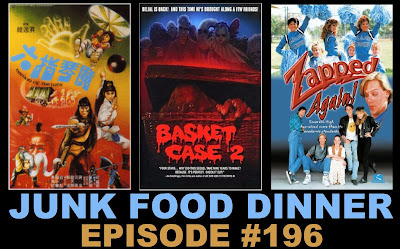 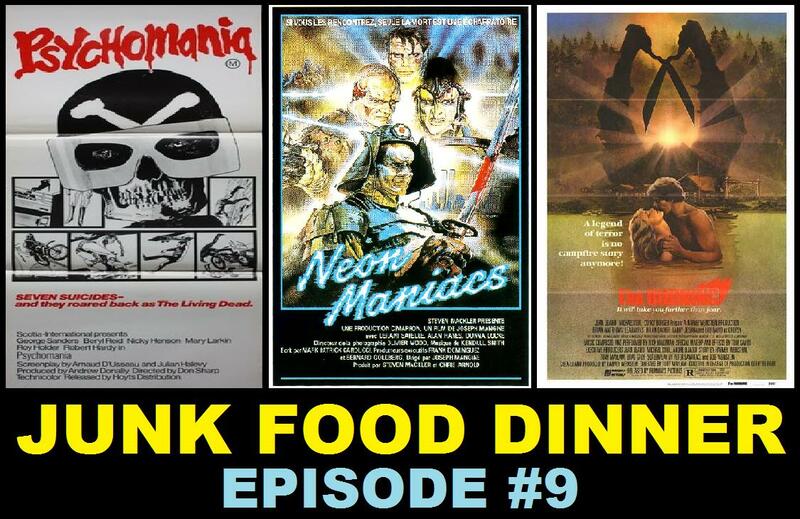 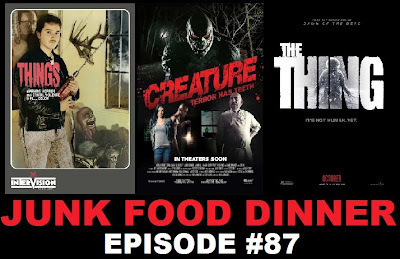 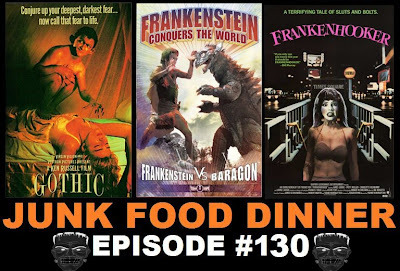 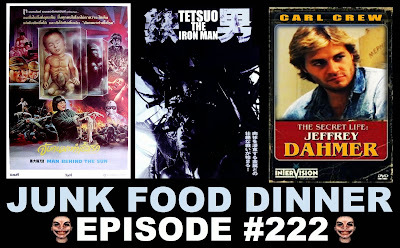 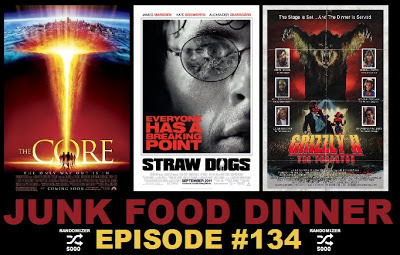 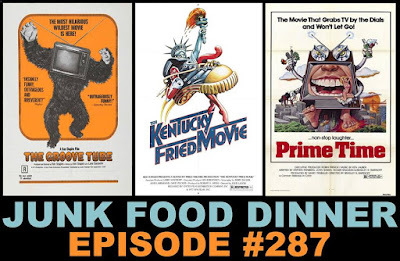 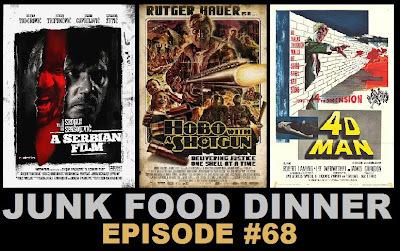 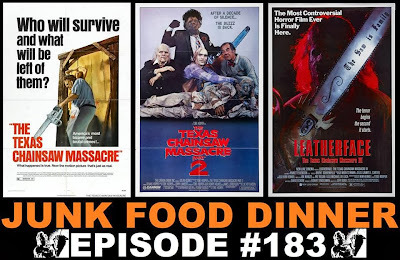 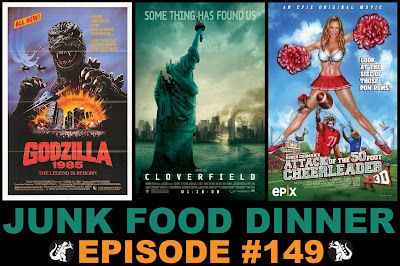 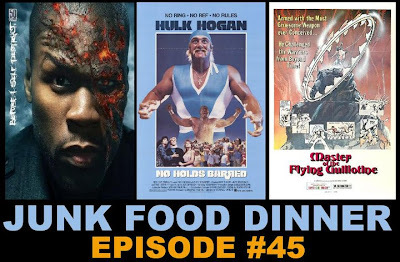 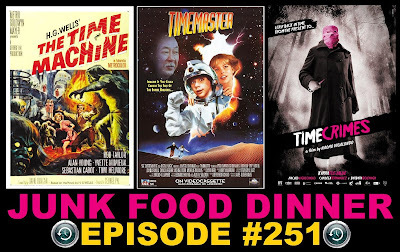 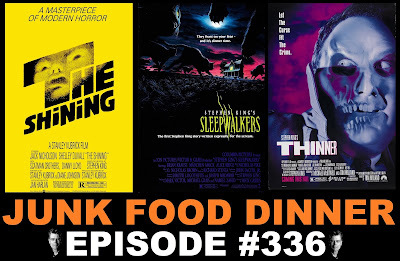 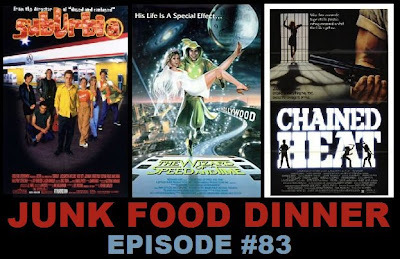 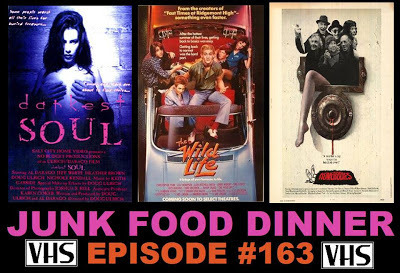 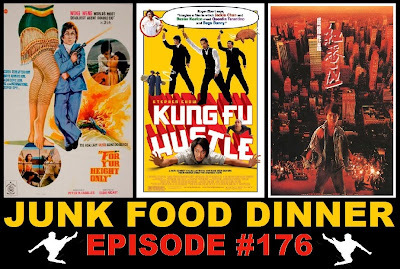 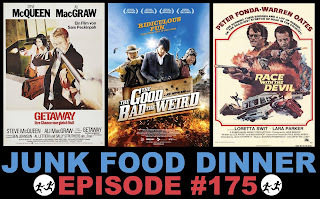 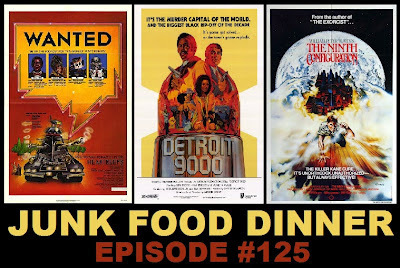 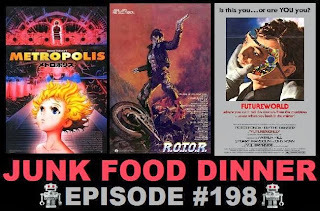 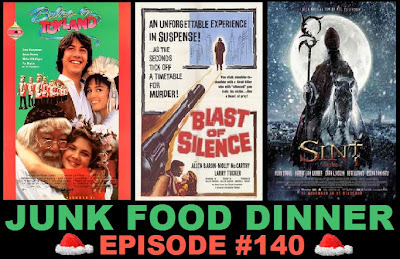 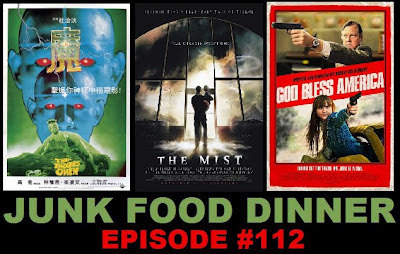 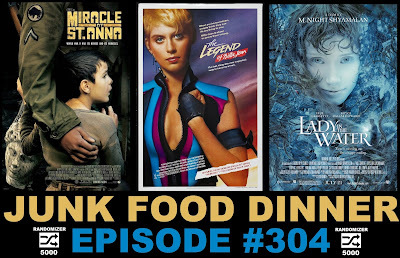 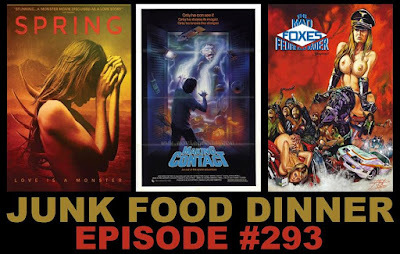 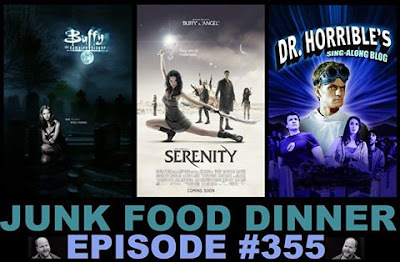 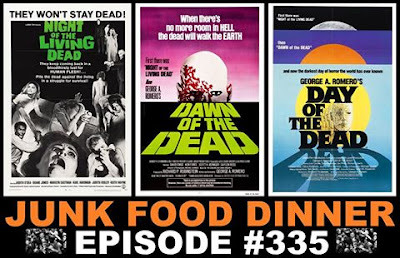 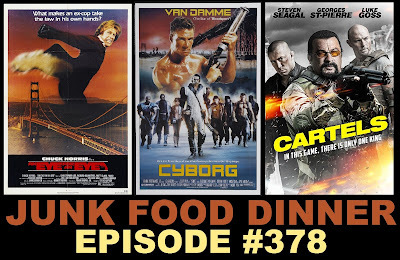 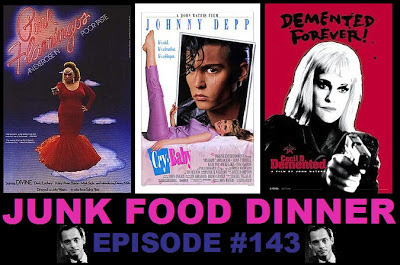 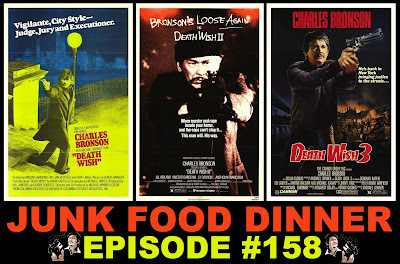 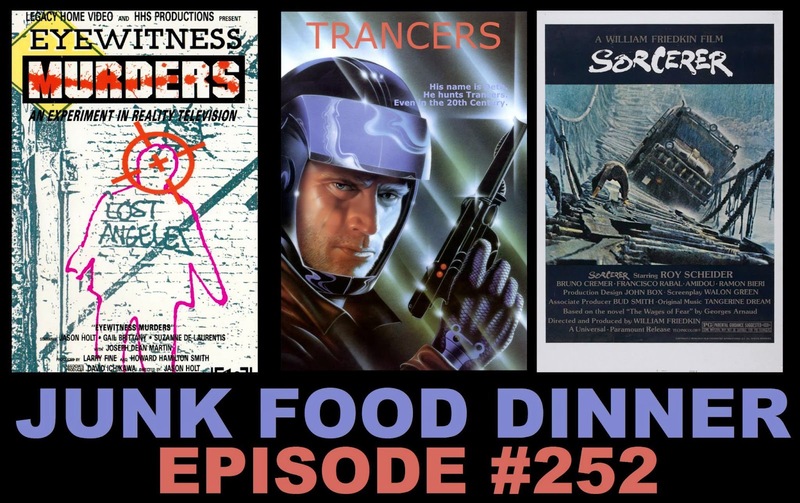 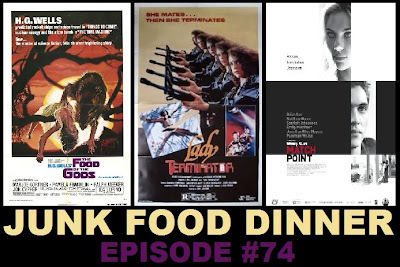 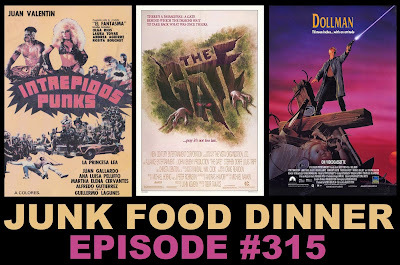 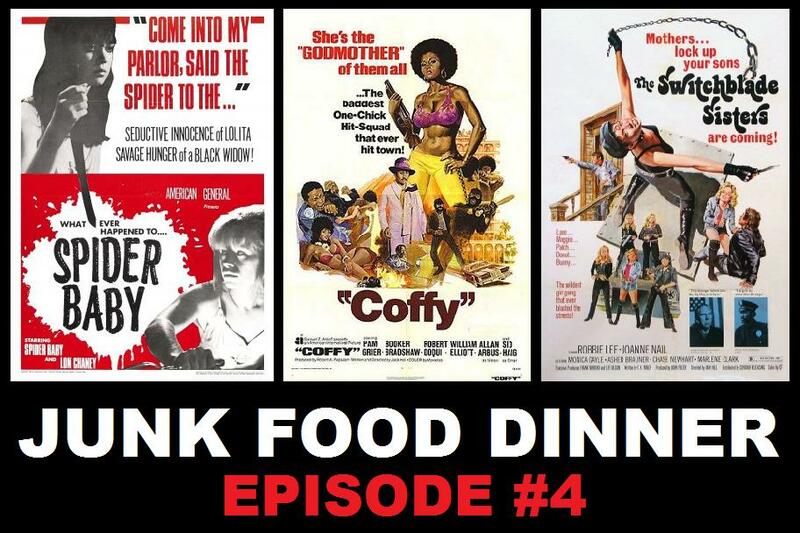 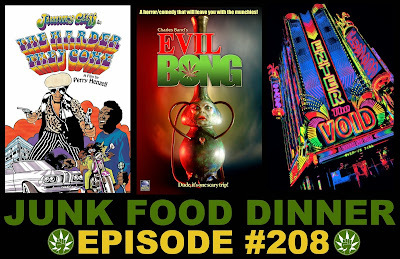 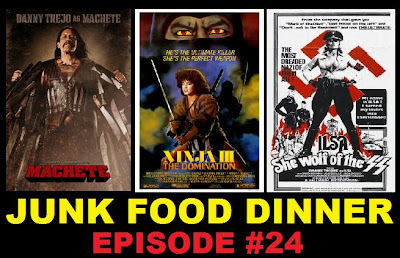 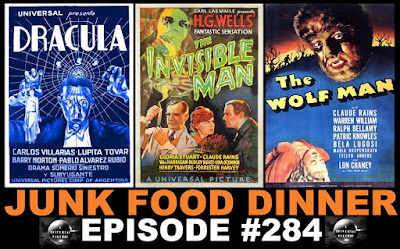 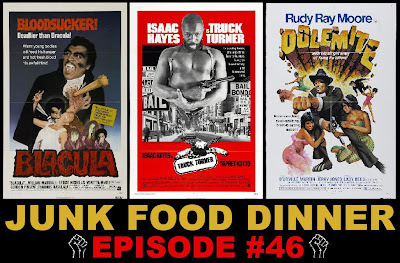 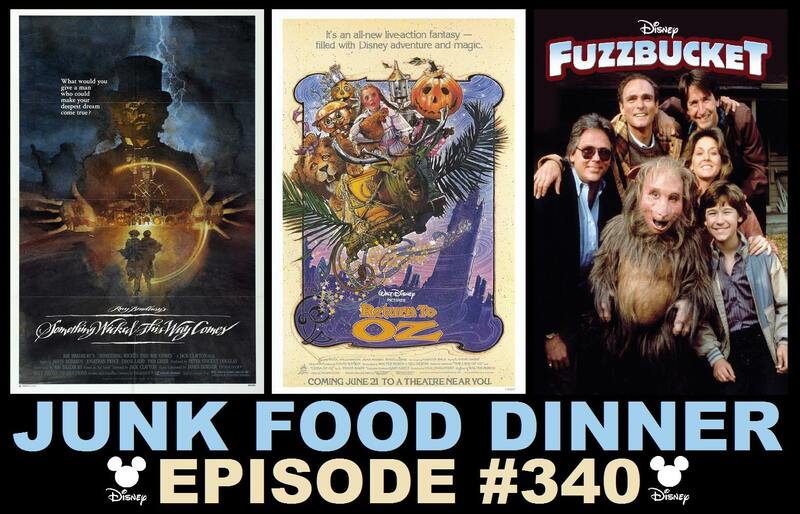 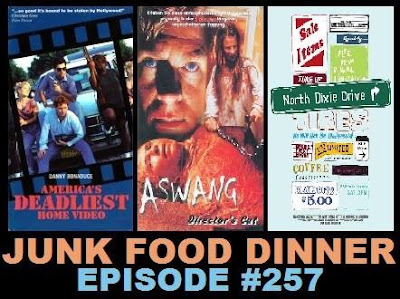 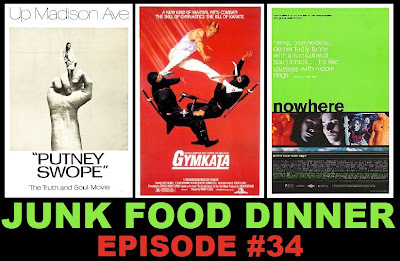 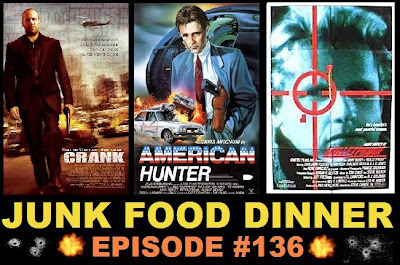 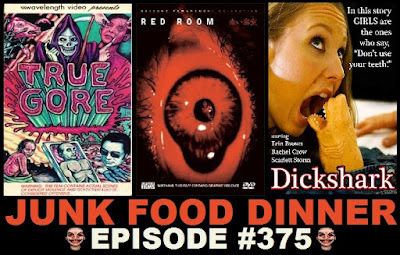 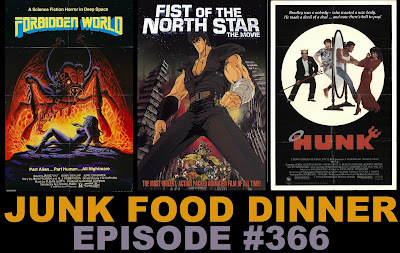 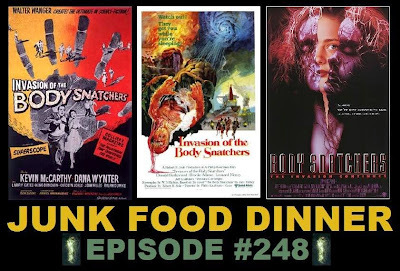 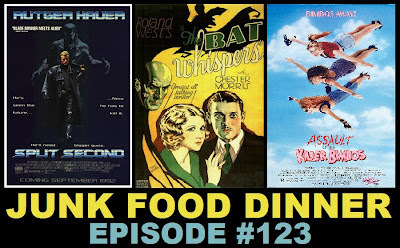 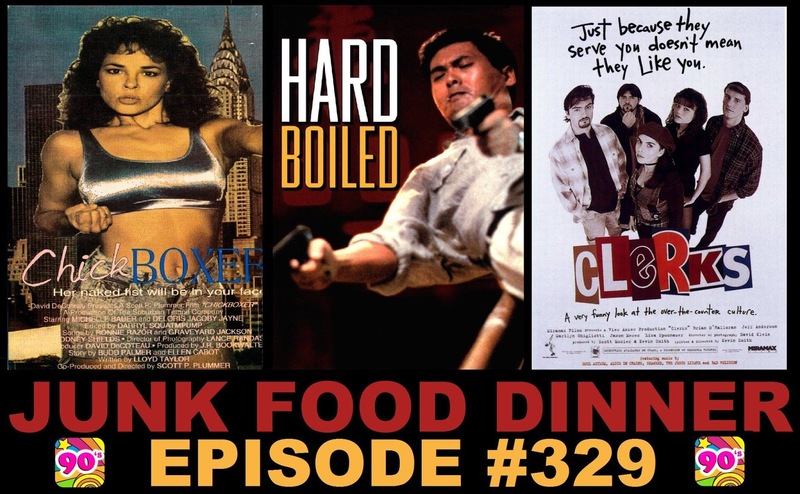 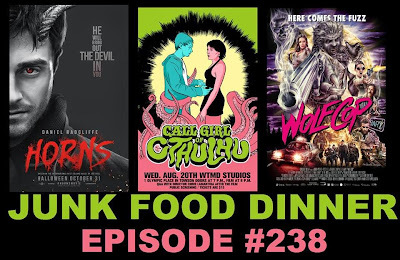 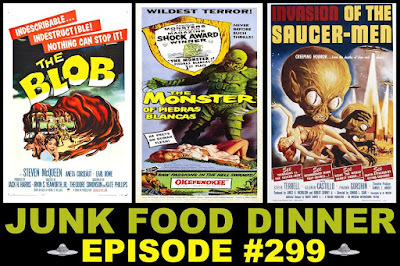 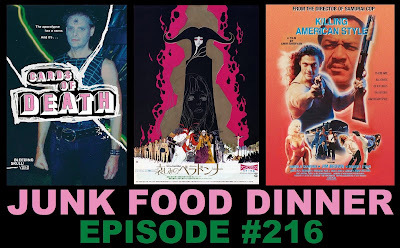 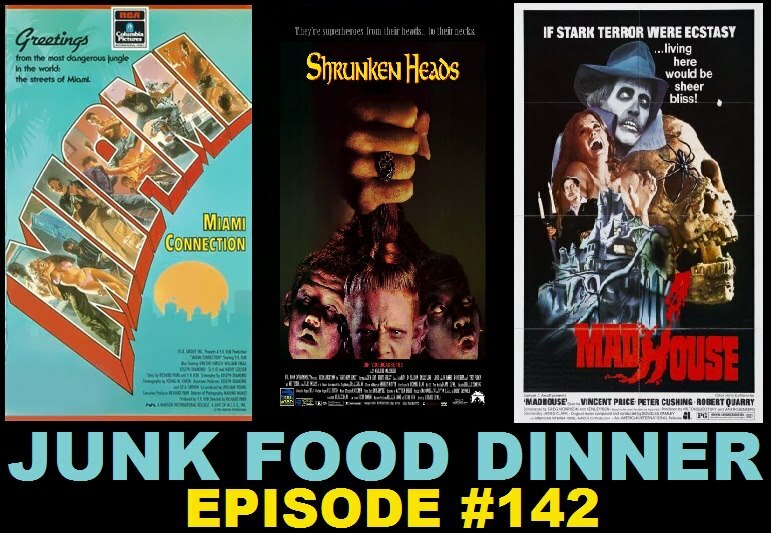 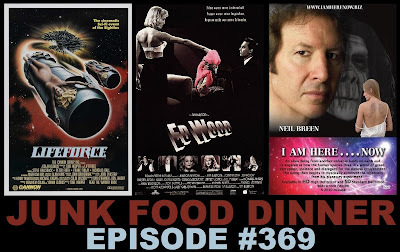 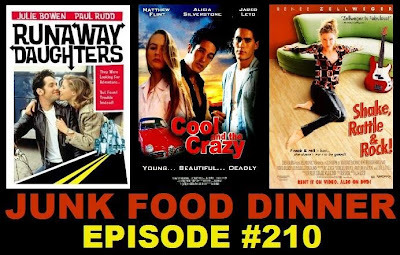 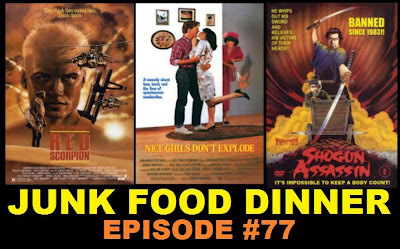 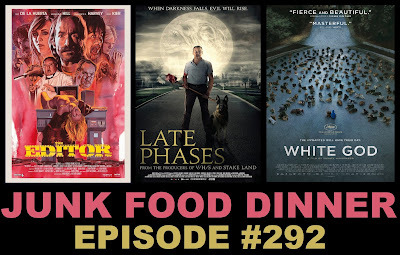 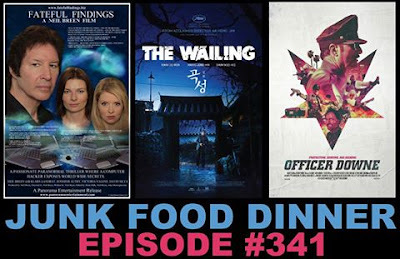 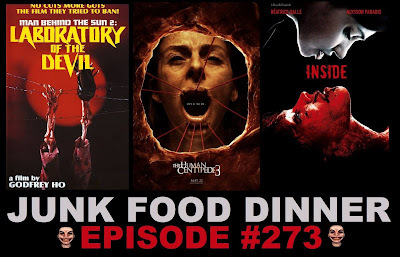 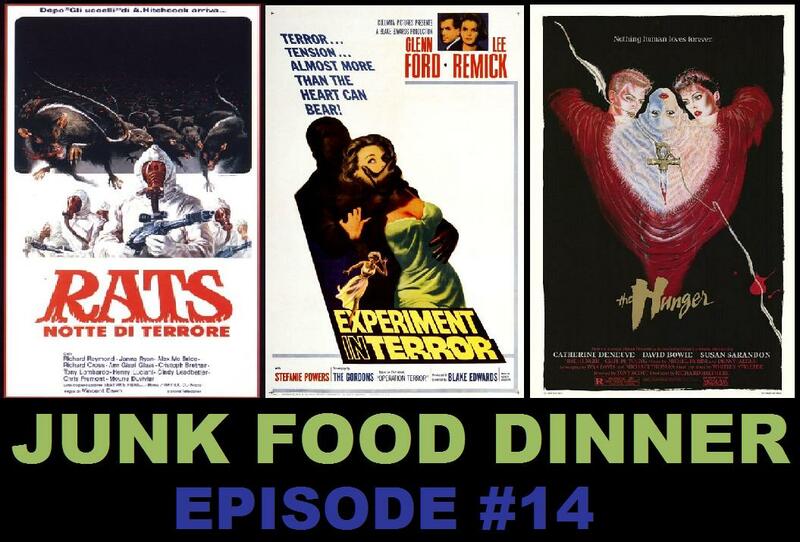 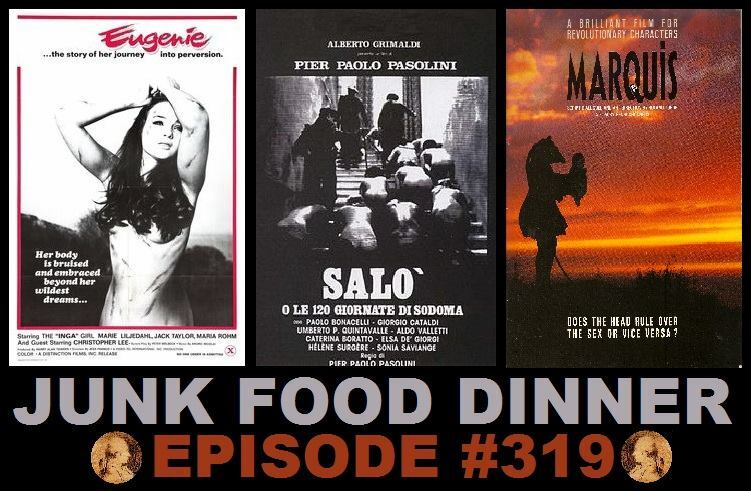 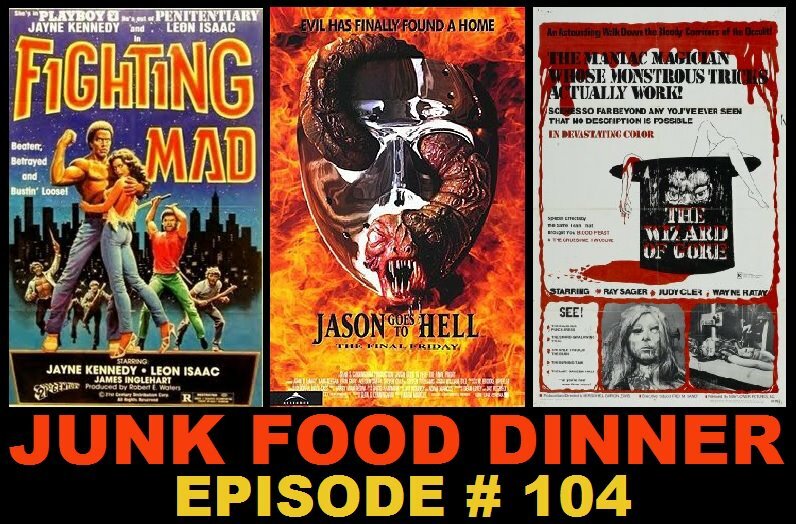 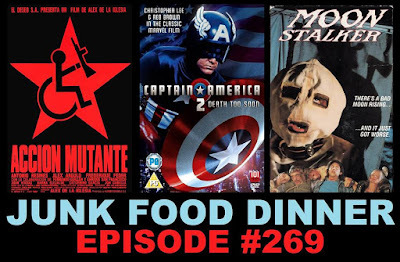 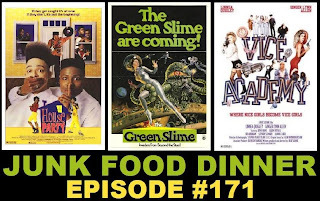 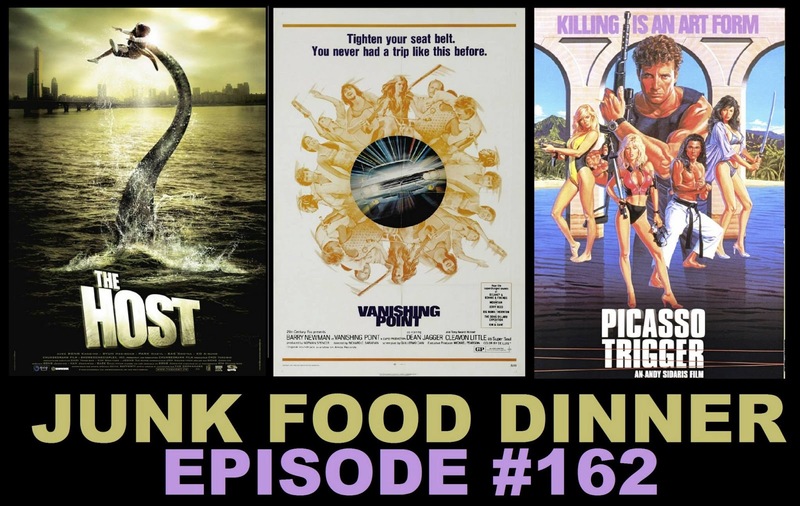 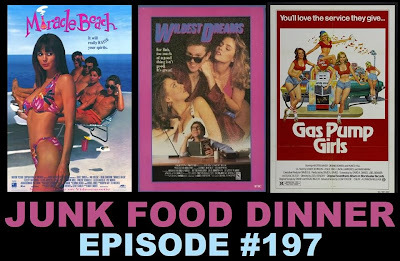 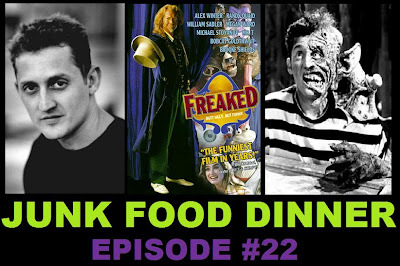 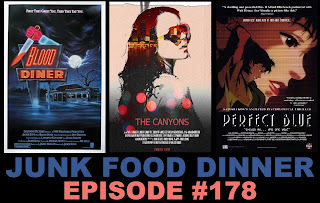 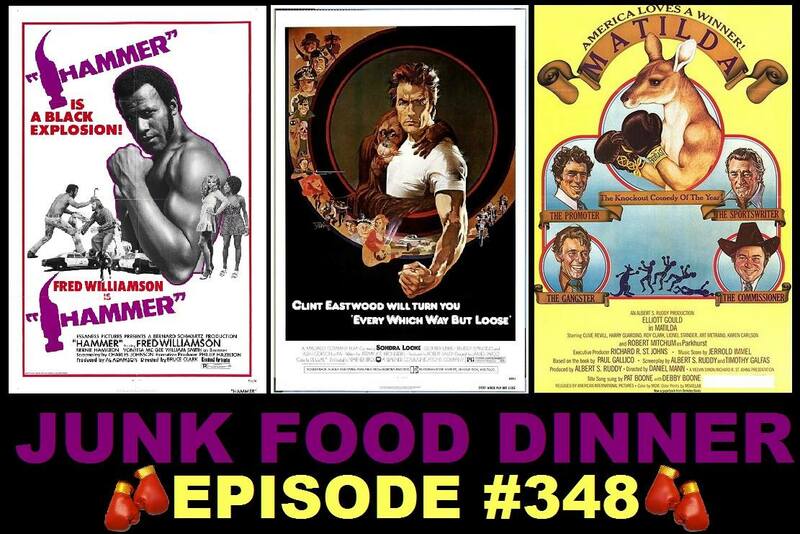 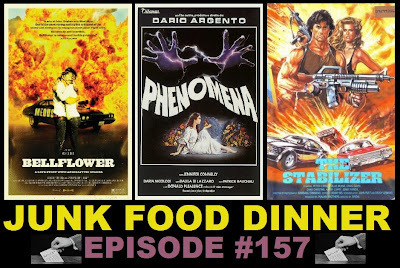 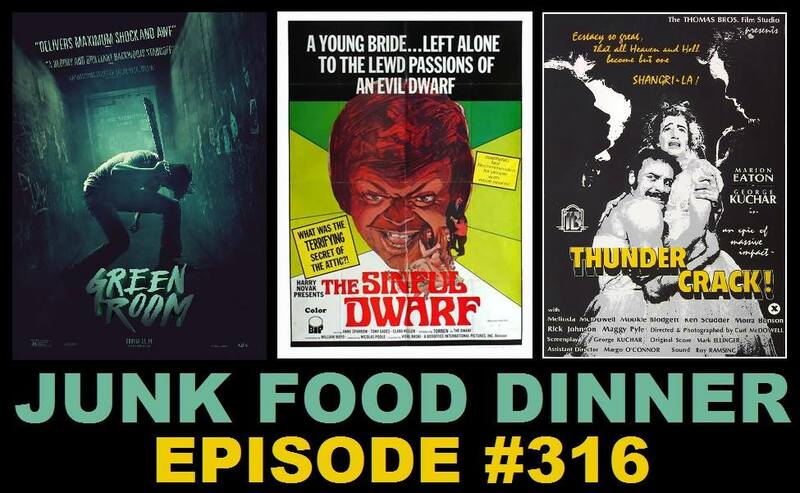 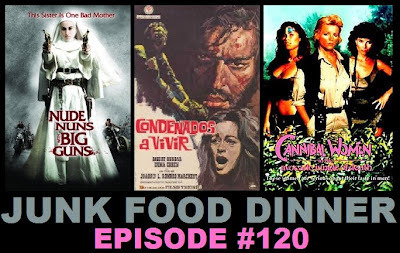 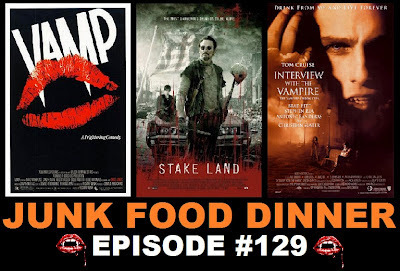 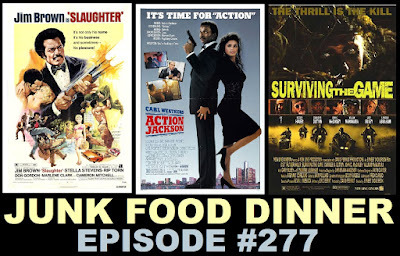 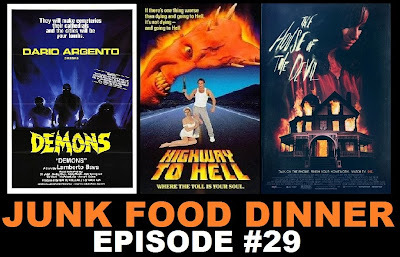 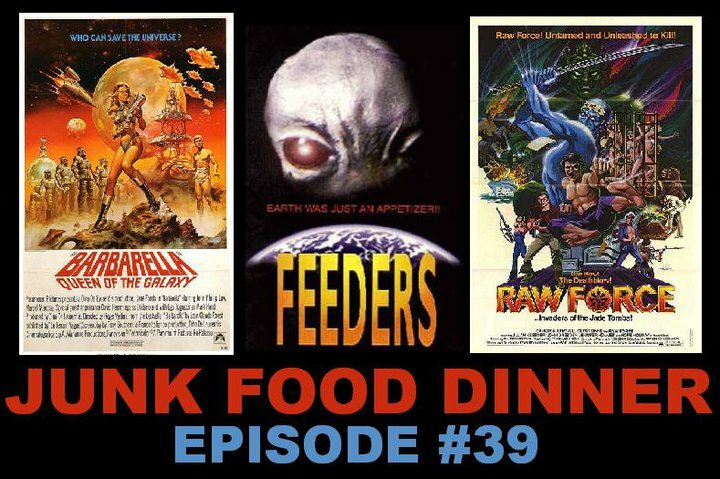 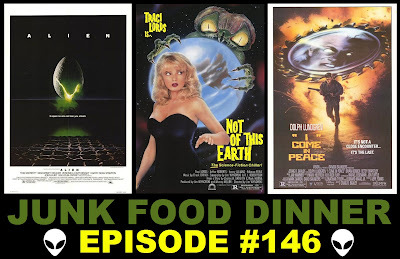 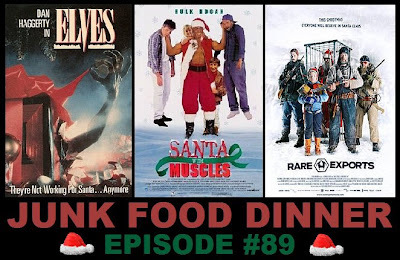 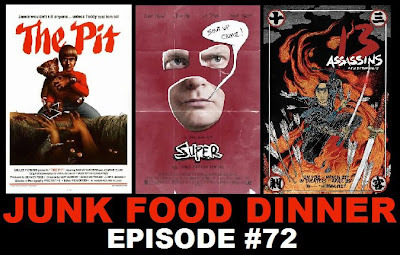 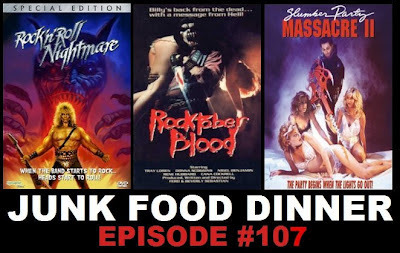 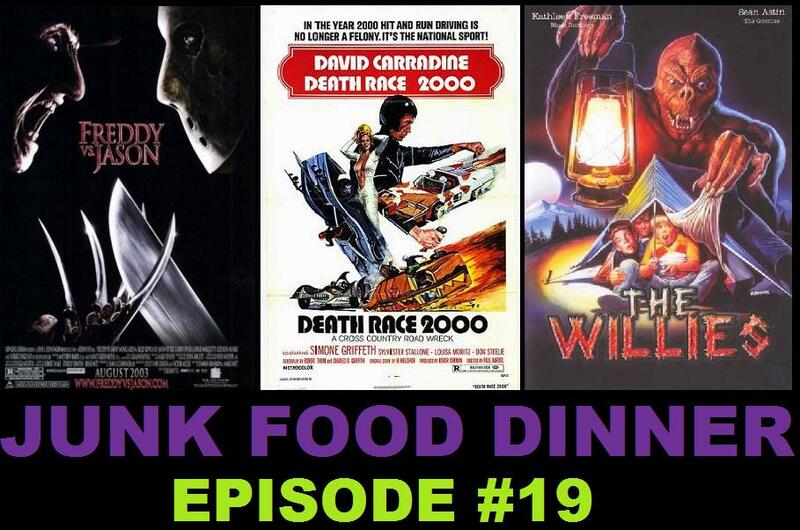 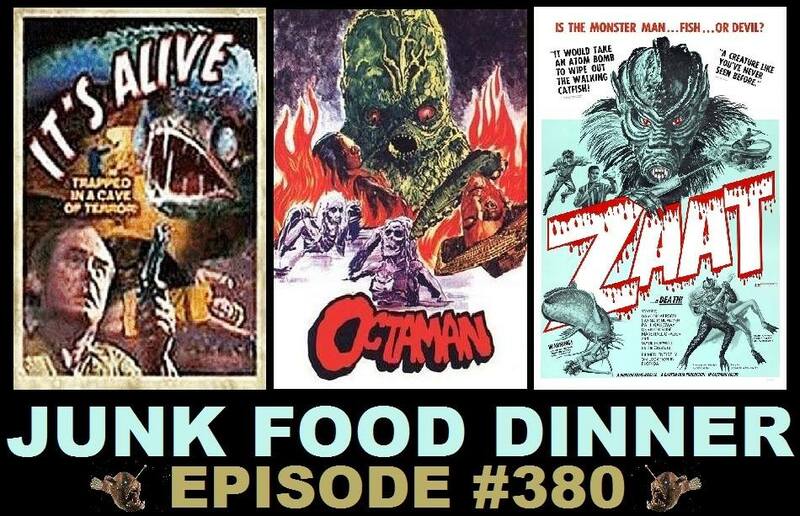 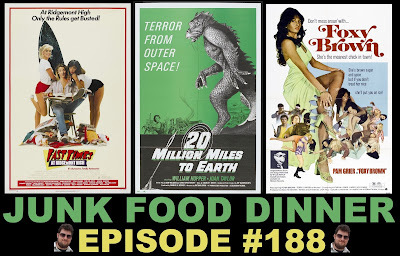 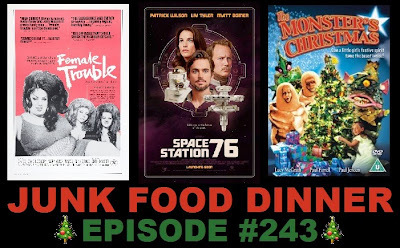 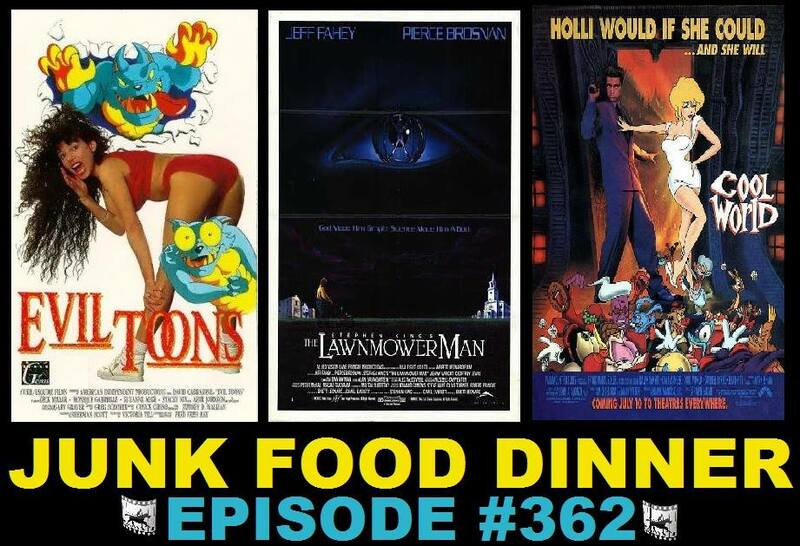 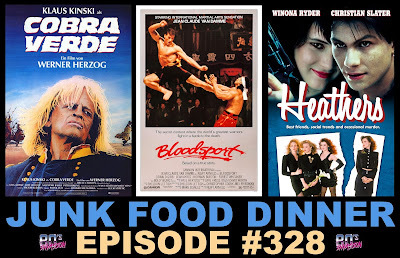 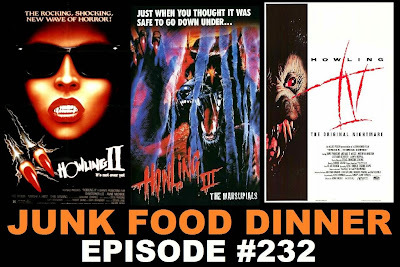 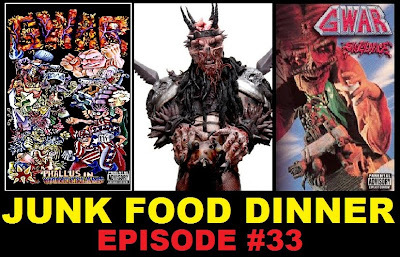 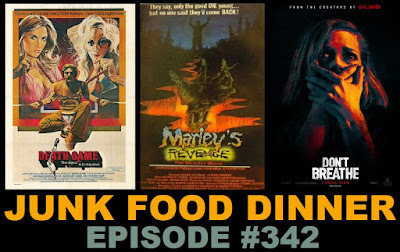 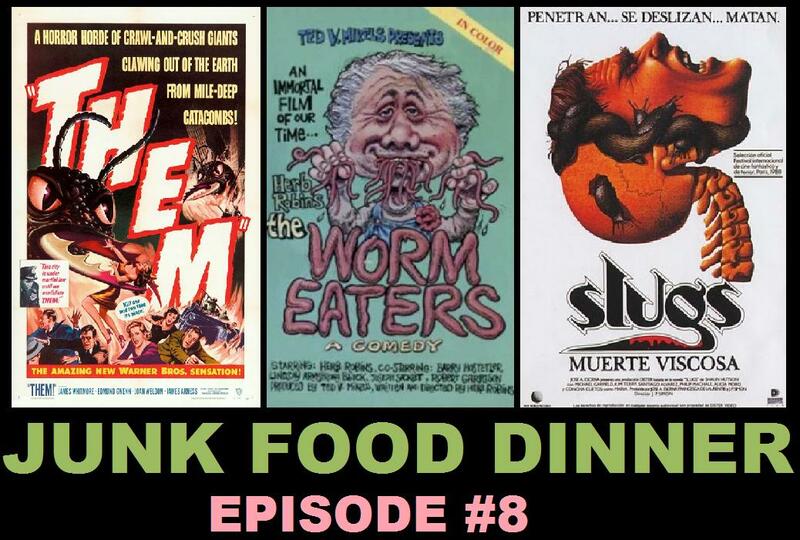 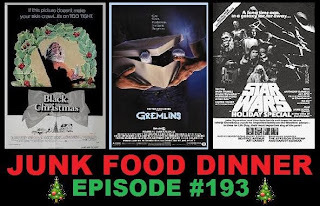 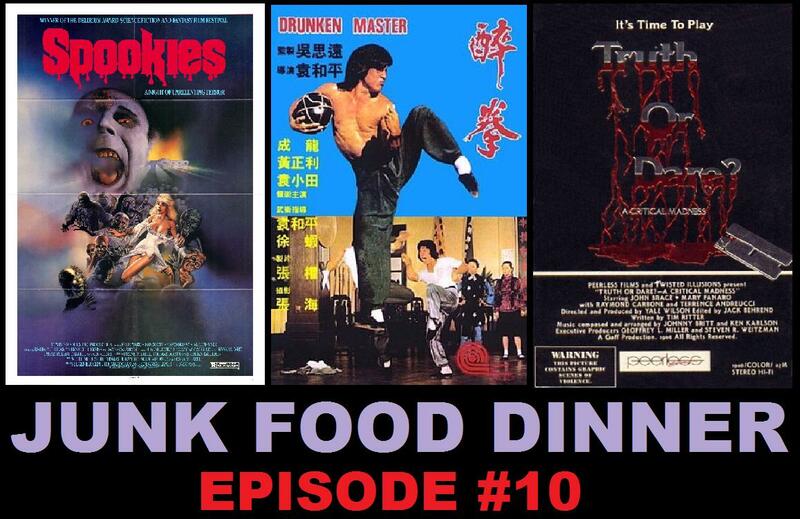 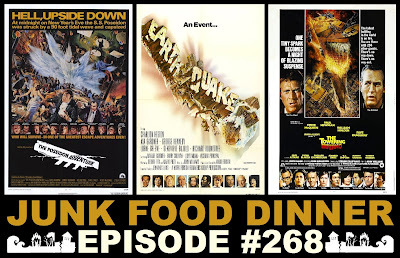 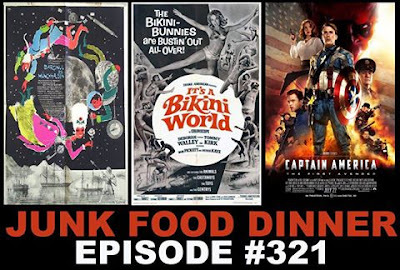 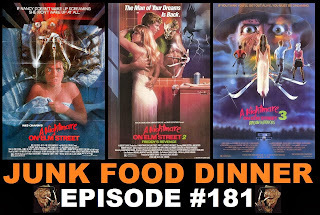 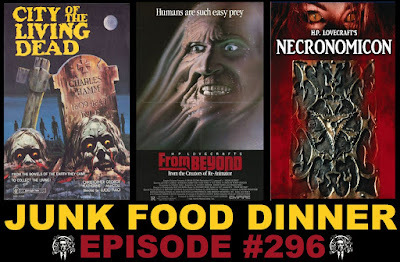 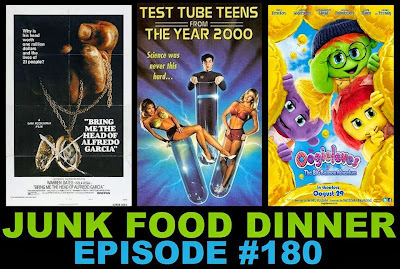 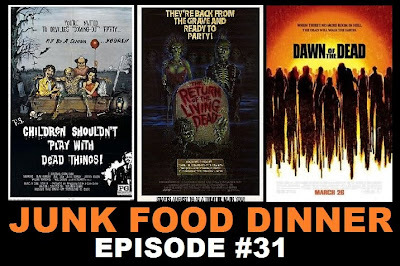 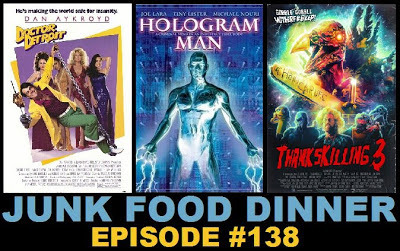 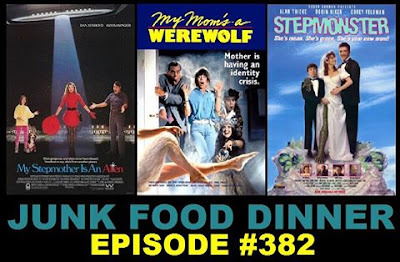 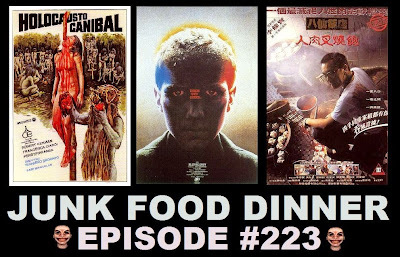 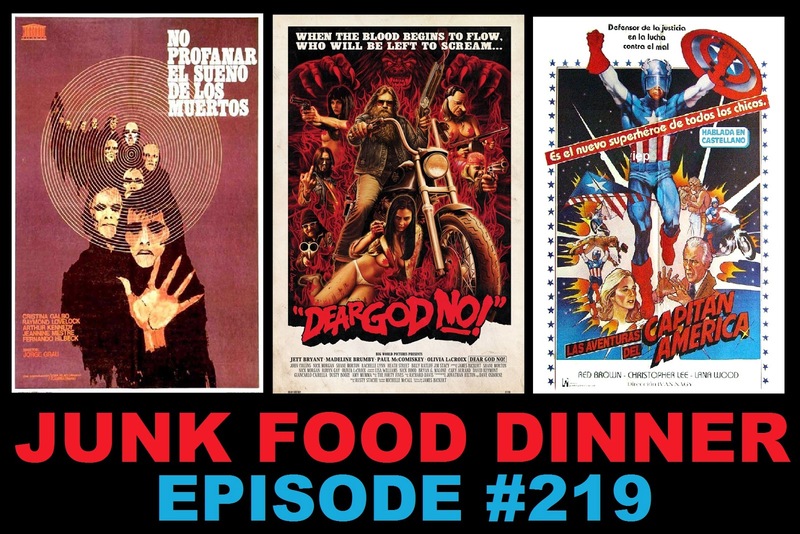 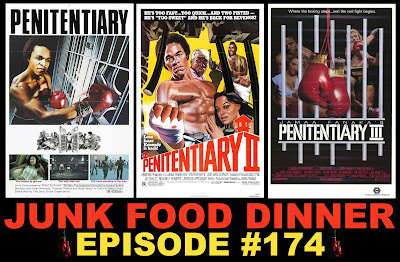 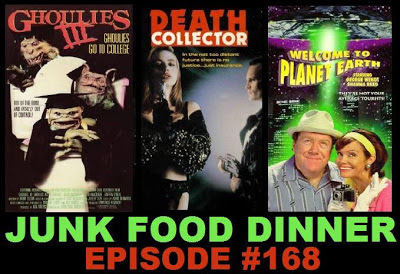 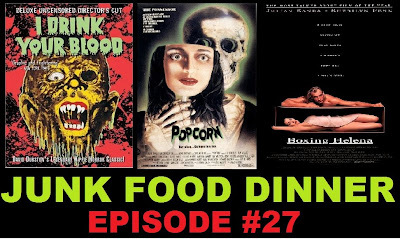 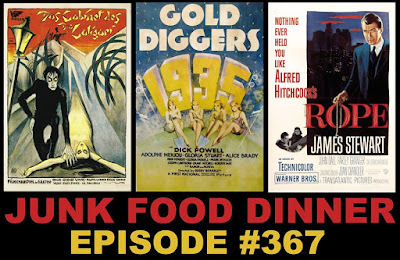 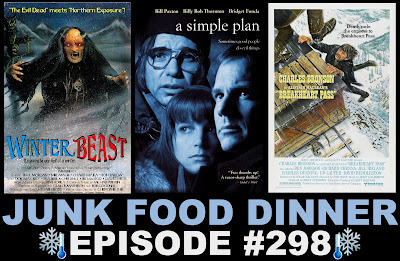 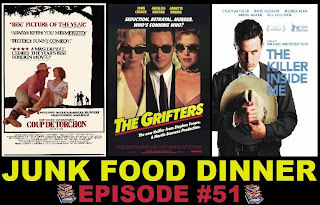 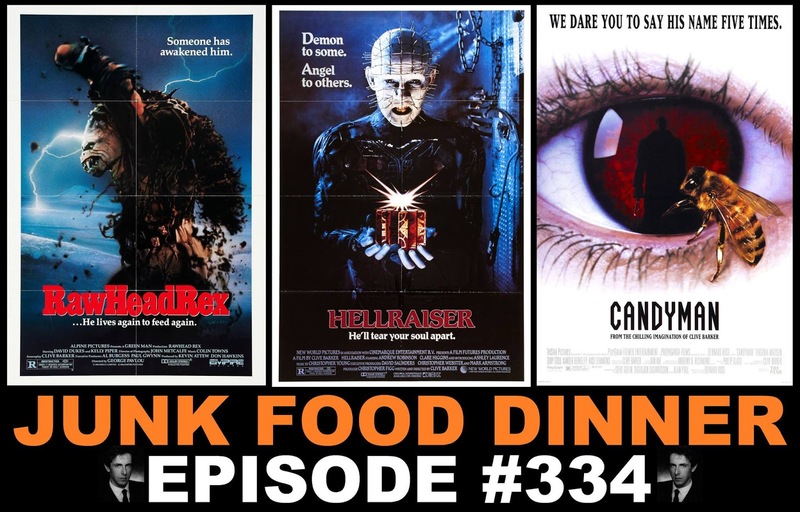 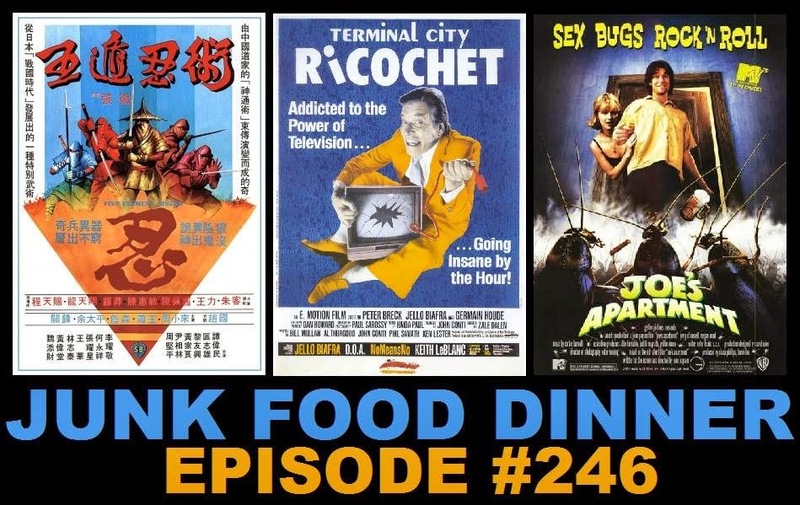 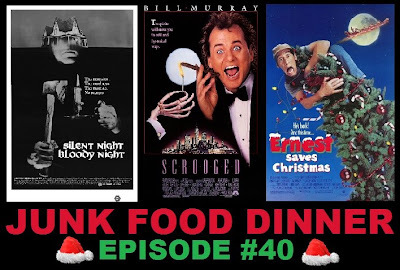 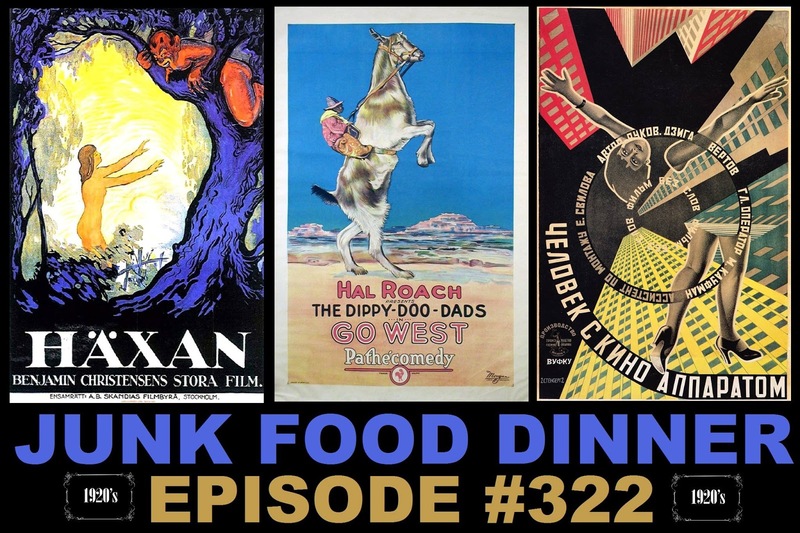 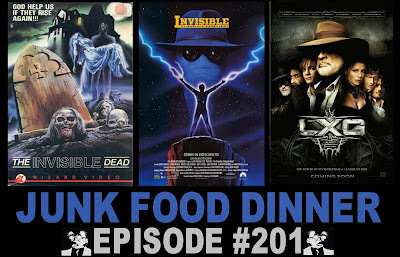 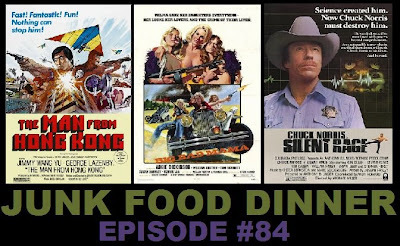 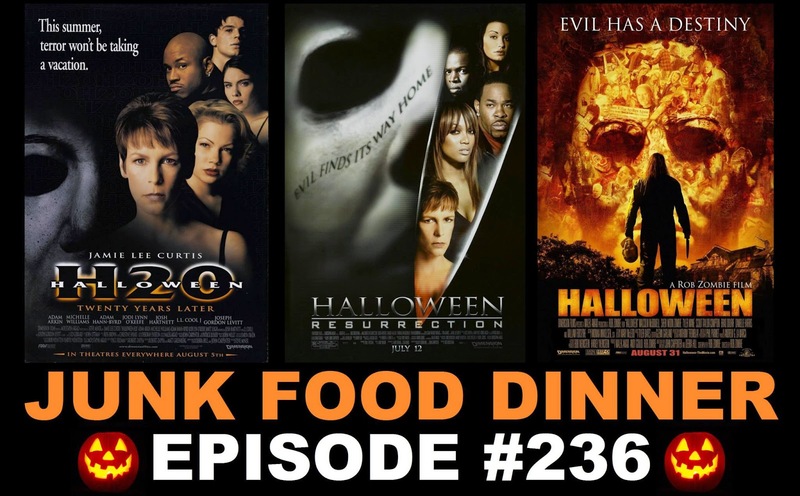 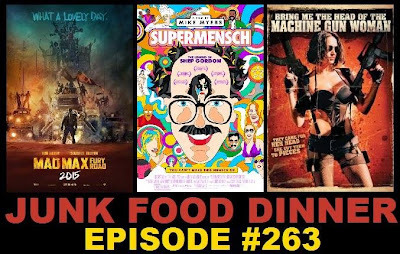 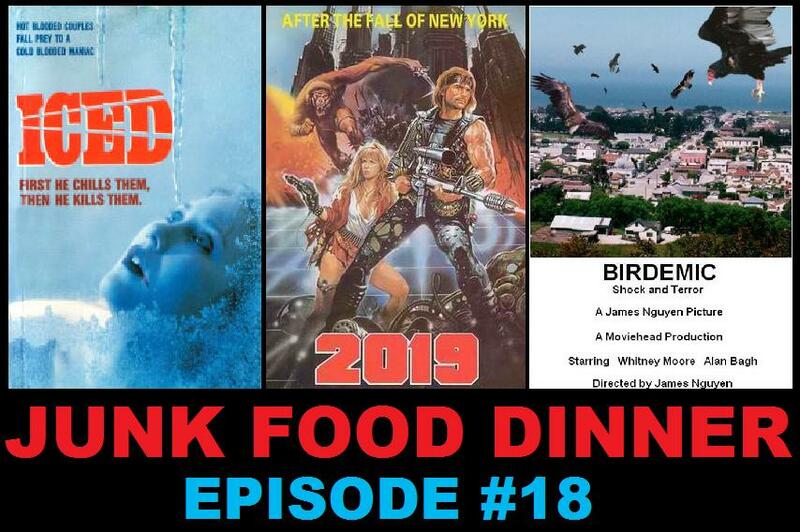 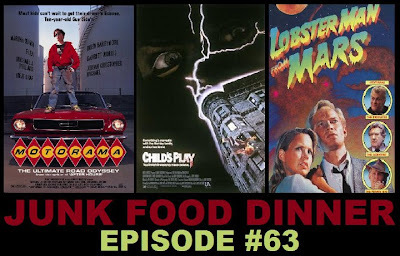 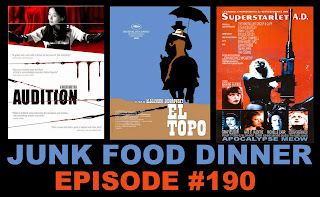 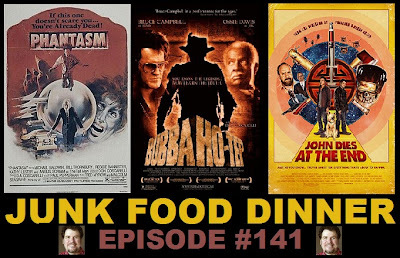 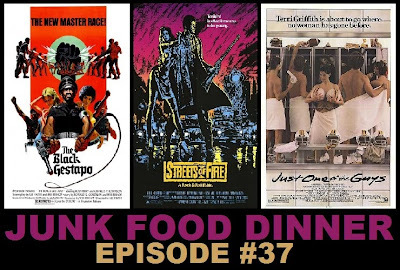 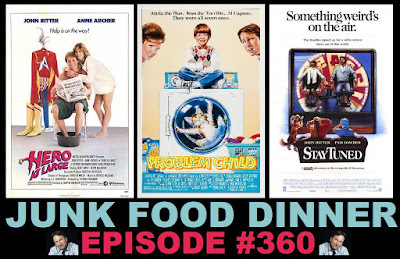 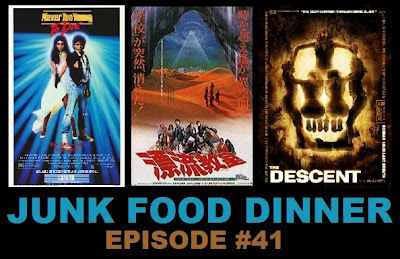 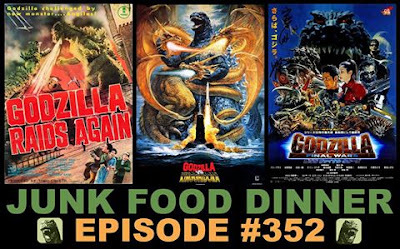 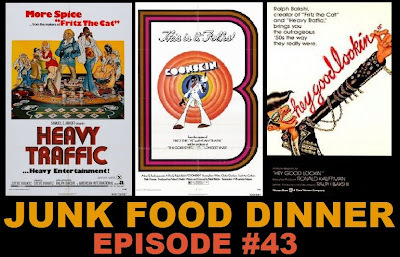 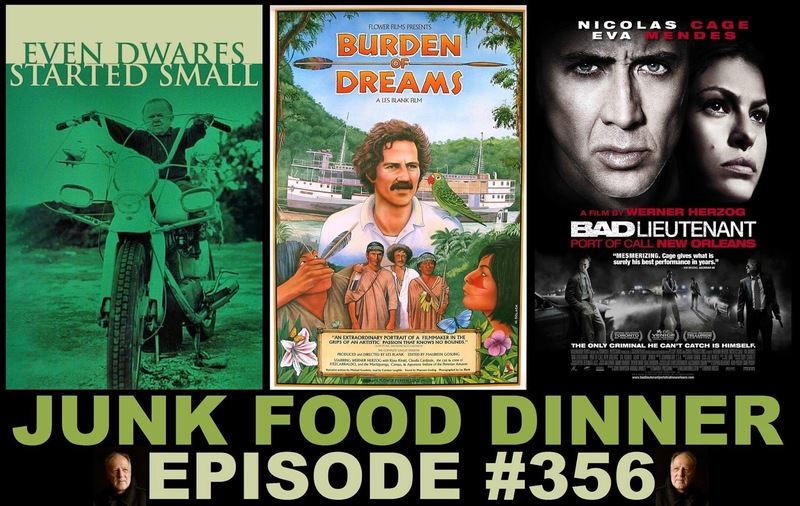 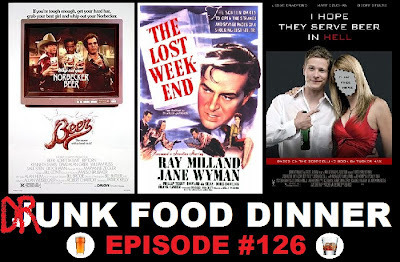 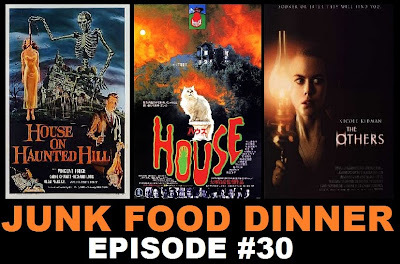 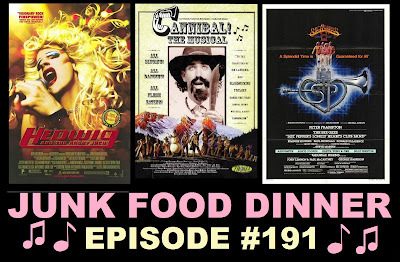 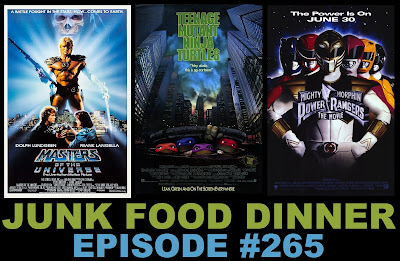 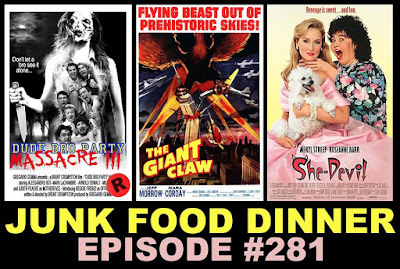 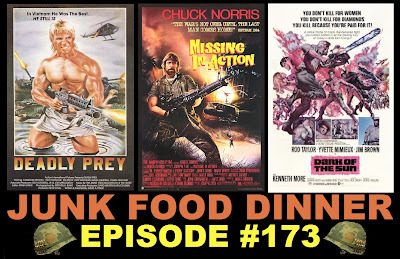 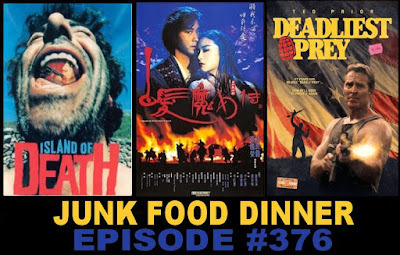 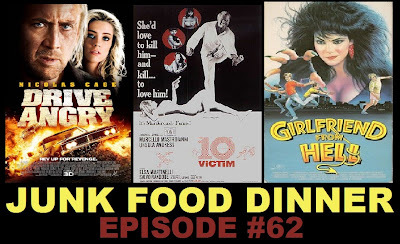 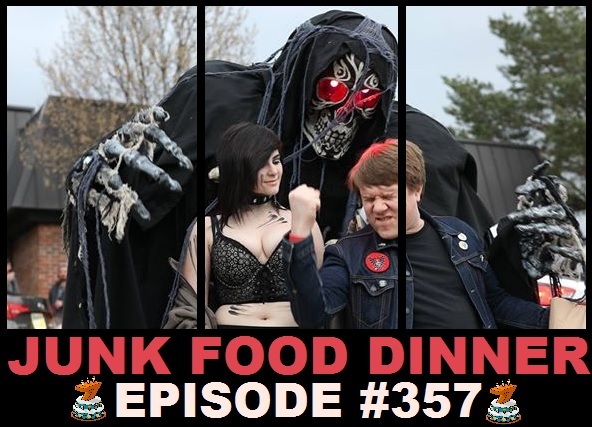 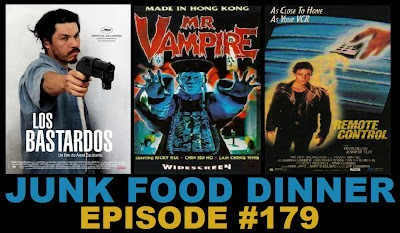 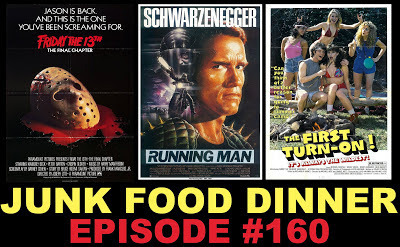 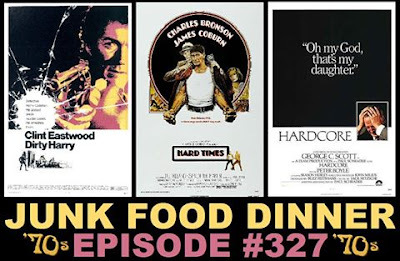 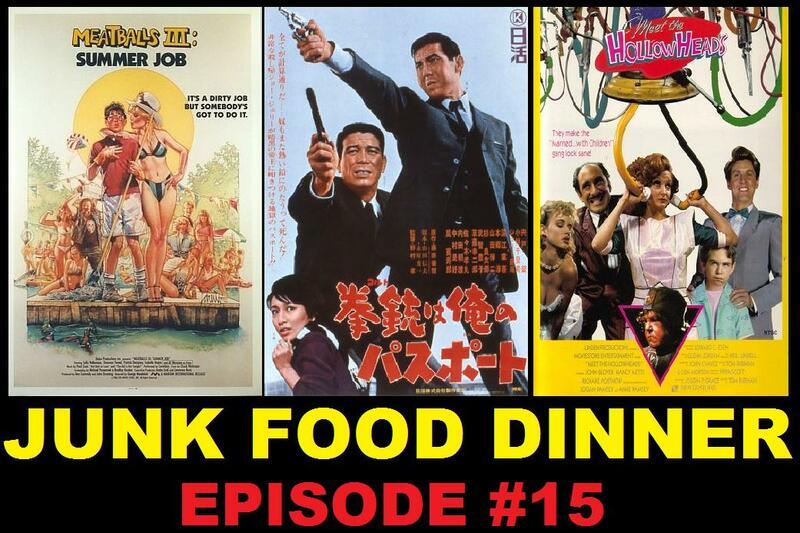 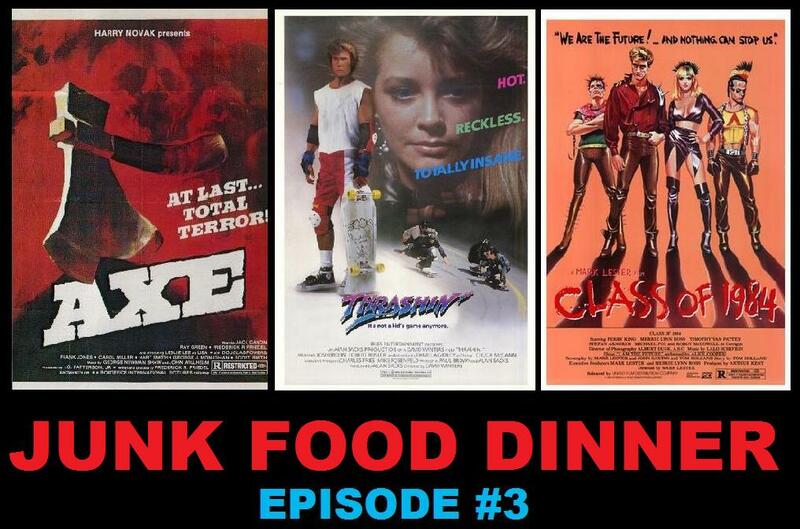 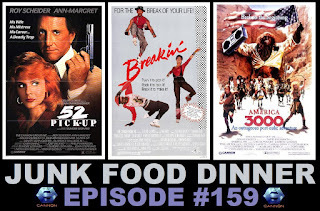 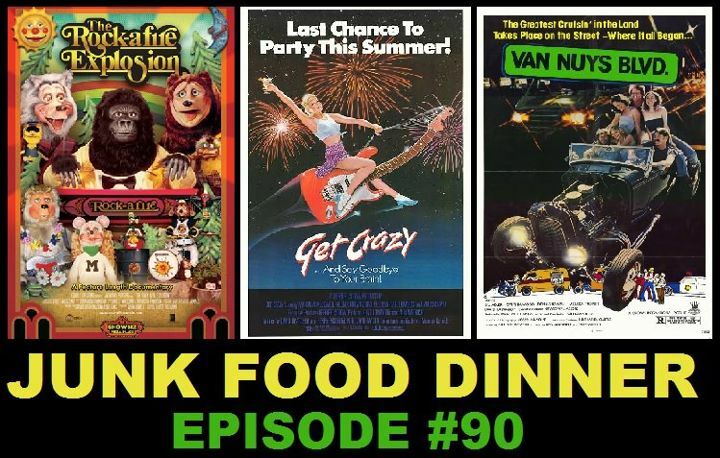 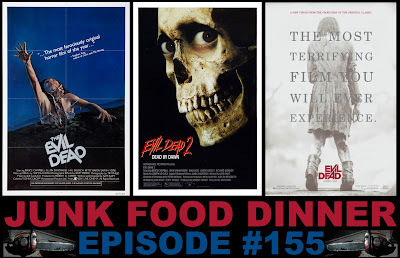 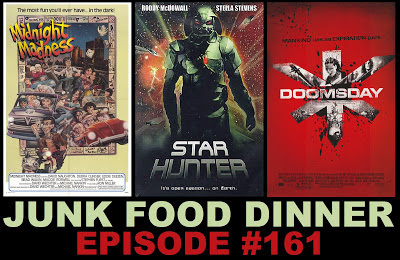 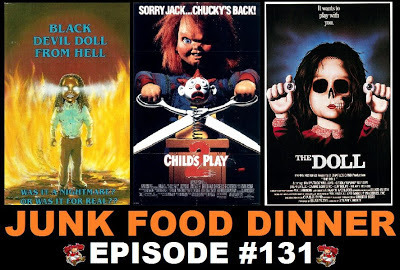 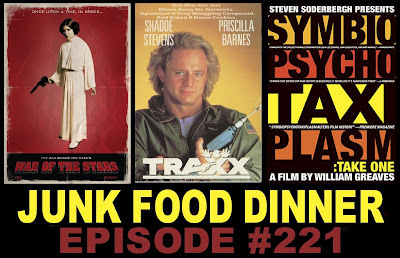 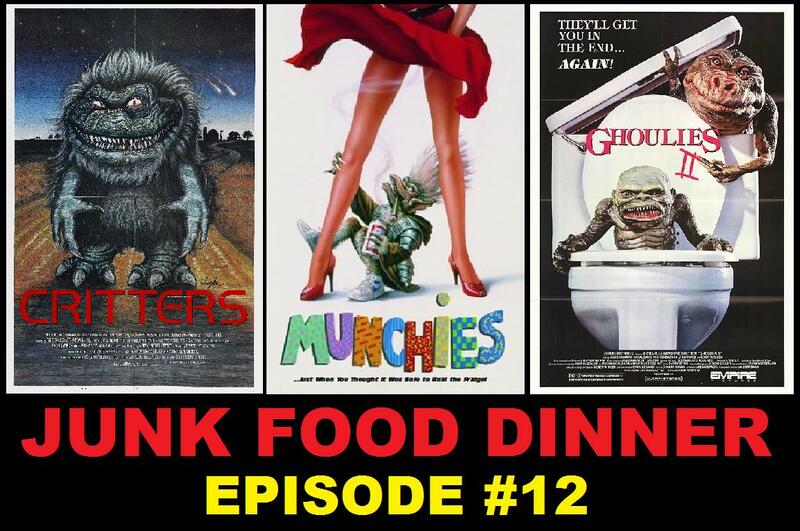 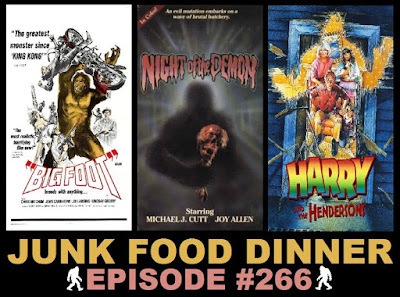 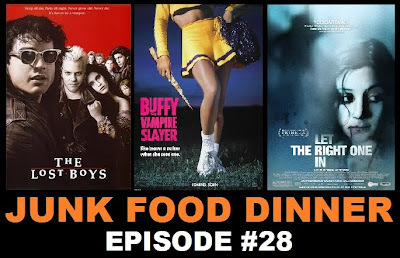 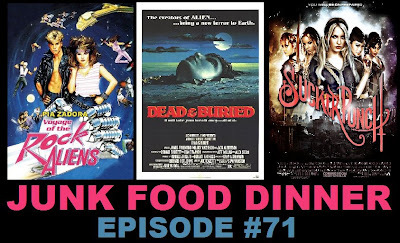 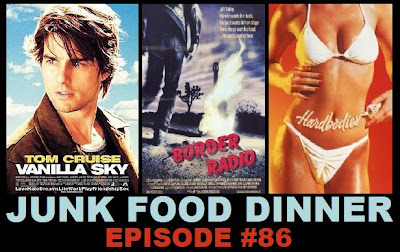 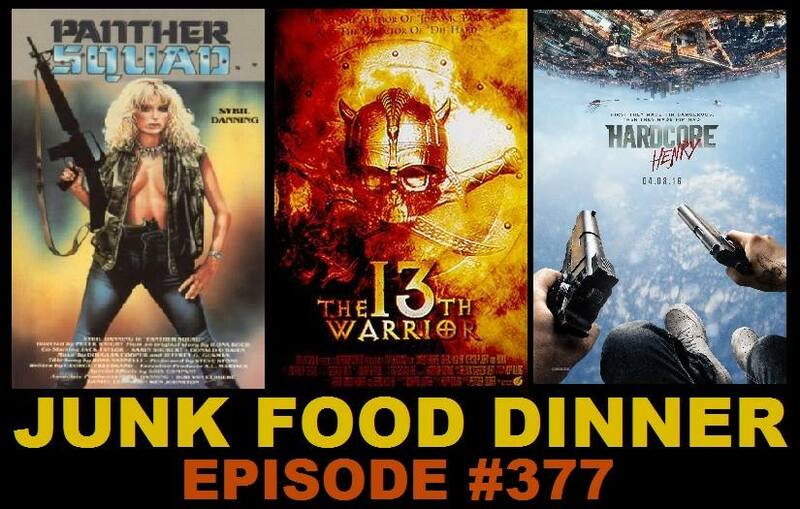 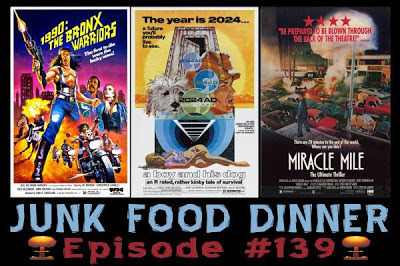 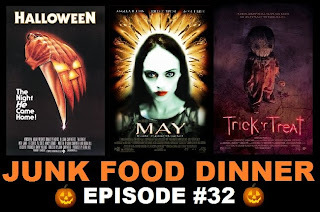 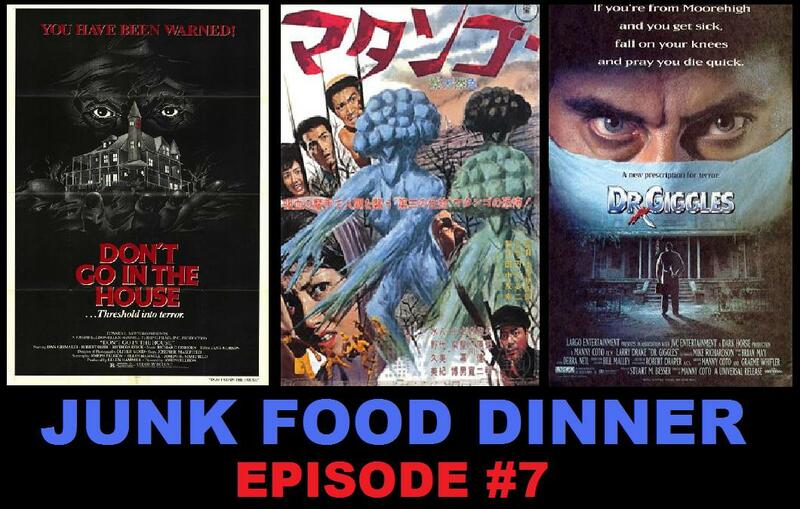 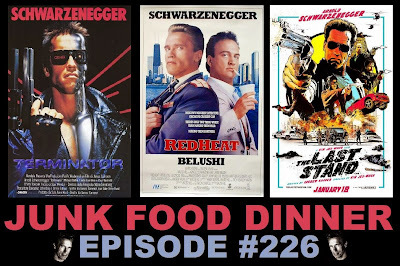 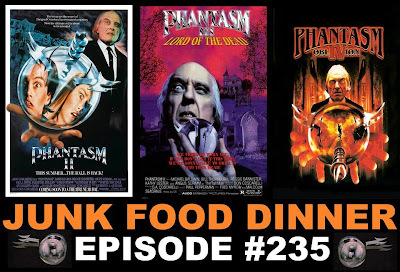 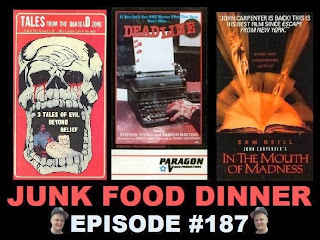 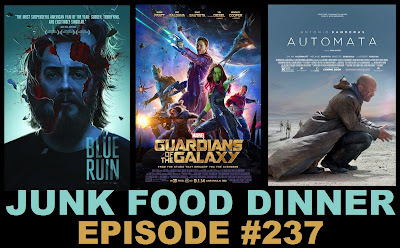 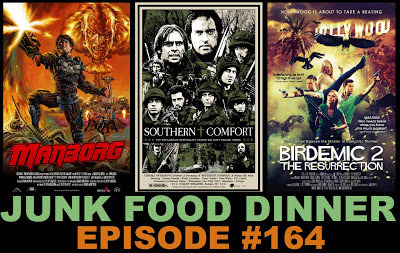 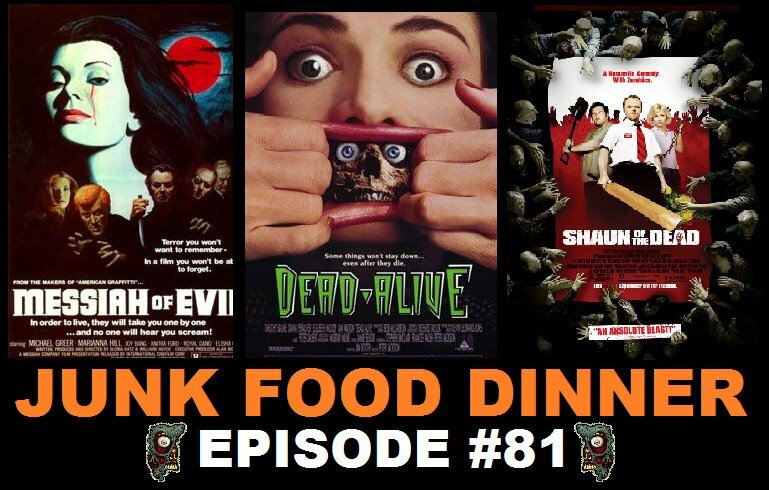 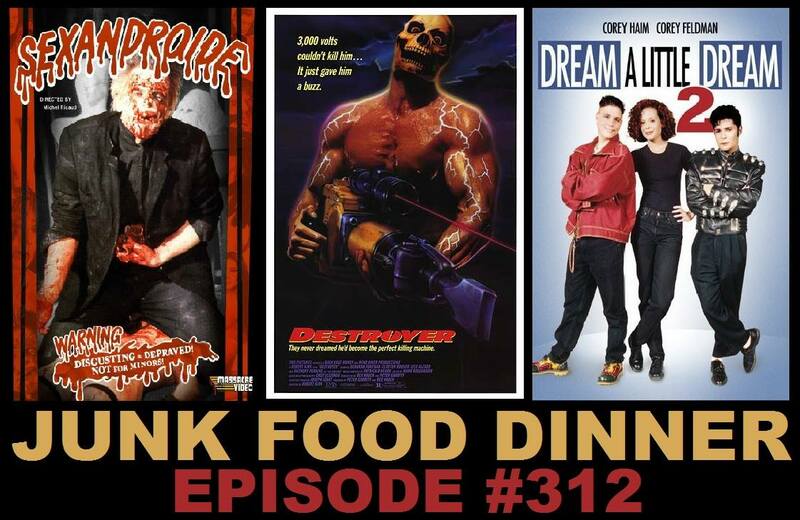 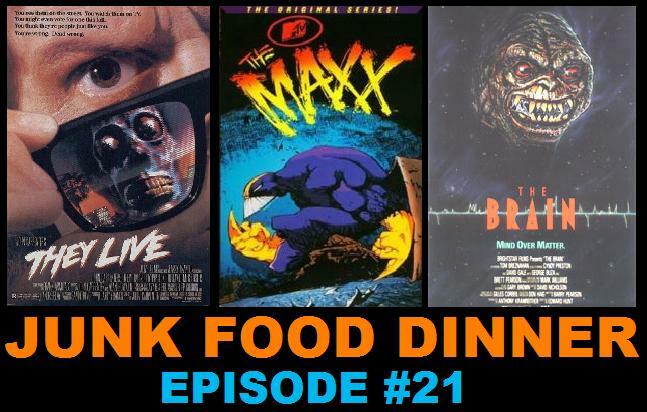 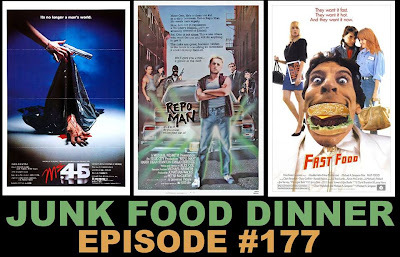 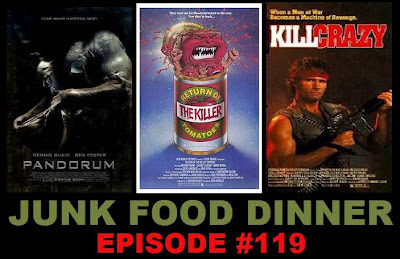 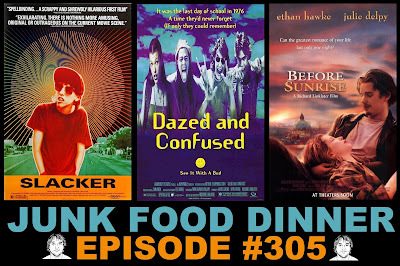 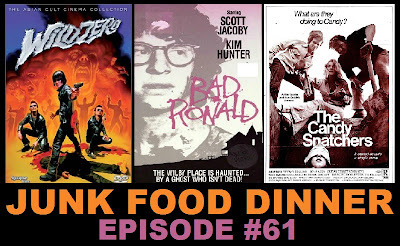 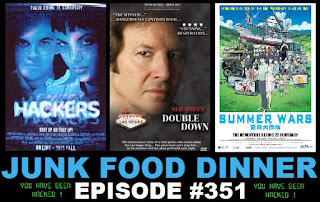 All this plus witty banter between friends, Frogtown Chat, Nerd News, this week's DVD and blu-ray releases, new ways to rate movies, Matthew Sweetman, possible upcoming contests and so much more!